Scott Dixon.Photo by Nico Matamoros. 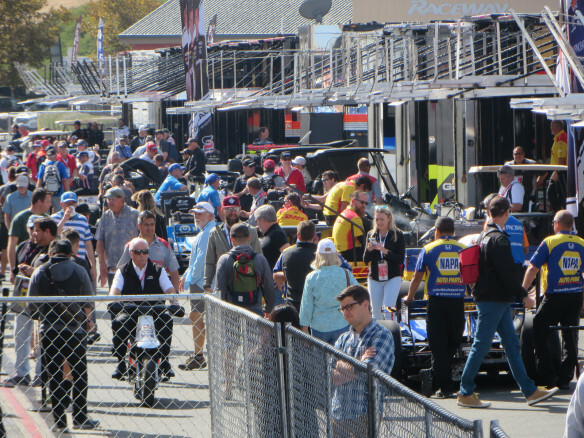 Saturday morning for the third/final practice session for the Verizon IndyCar Series at Sonoma Raceway was sunny, bright and breezy. It was crystal-clear visibility, with nary a cloud in the sky, compared to Friday afternoon when so many whispy clouds floated and covered that it was a spectacular sunset. The ambient temperature Saturday morning was climbing towards 70 degrees. Left to Right: Alexander Rossi, Josef Newgarden, and Will Power. Photos by Nico Matamoros. 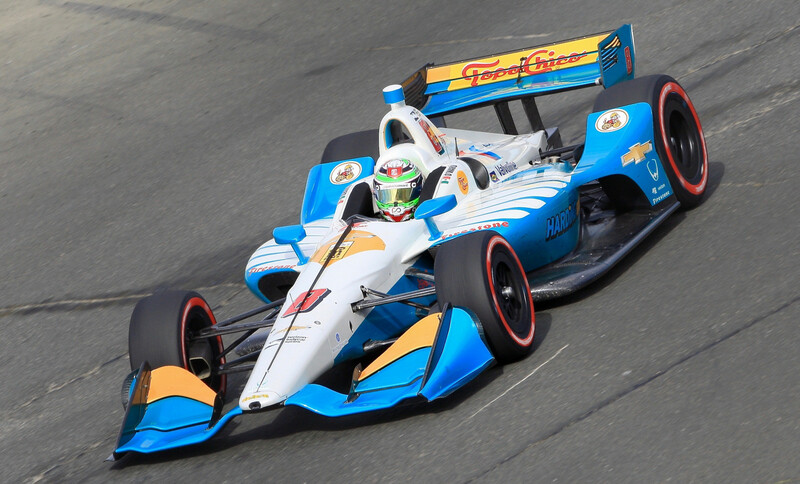 The four Contenders for the 2018 Championship are Scott Dixon/No.9 PNC Bank Chip Ganassi Racing Honda; Alexander Rossi/No.27 NAPA AUTO PARTS Andretti Autosport Honda; Josef Newgarden/No.1 Verizon Team Penske Chevrolet; and Will Power/No.12 Verizon Team Penske Chevrolet. In that order. And all were in the Top Five at the Checkered Flag. Dixon was the final fastest driver at 1:17.9697/110.120 mph. Second through fifth were Power, Ryan Hunter-Reay/No.28 DHL Andretti Autosport Honda; Rossi and Newgarden. 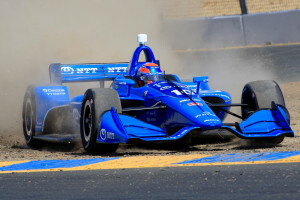 Overall time-wise, Dixon and Power were fastest in the first session, Newgarden in the second, and Rossi in the third. Zach Veach/No.26 Group 1001 Andretti Autosport Honda was the fastest Rookie, in seventh position. 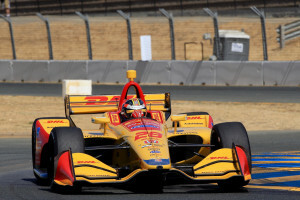 Overall, for the weekend, Ryan Hunter-Reay is still the fastest at 1:17.5742/110.681 mph. 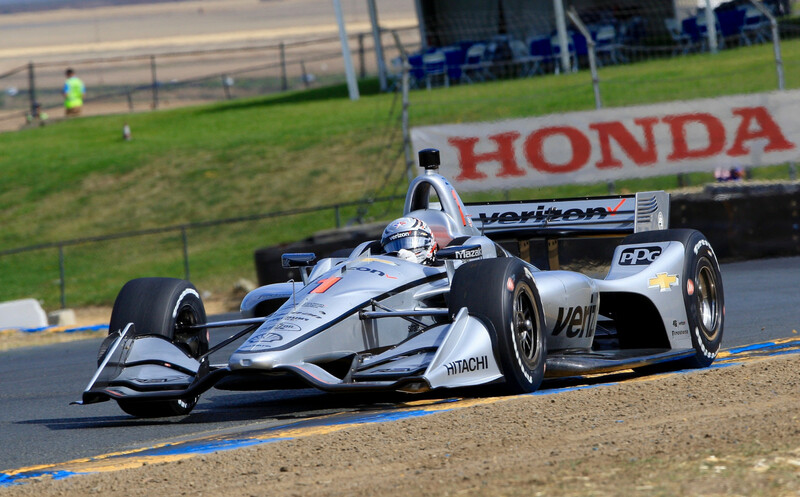 The qualifying track record of 1:15.5205/113.691 mph was set last year by Newgarden. It was almost a full Green Flag session, until a Turn 9 spin and stall brought out the Red Flag. Carlos Munoz/No.6 Lucas Oil SPM Honda was quickly retrieved, and the down time was only 1:59 minute. The session restarted, and the drivers got another lap or two. Someone said Friday, in terms of race strategy, “Four drivers have everything to lose, and 20 drivers have nothing to lose.” Actually, it would be 21 as there are 25 drivers in the final field for 2018. Rookie Santino Ferrucci/No.39 Cly-Del Dale Coyne Racing Honda; Takuma Sato/No.30 Mi-Jack/Panasonic Rahal Letterman Lanigan Racing Honda; and Dixon. 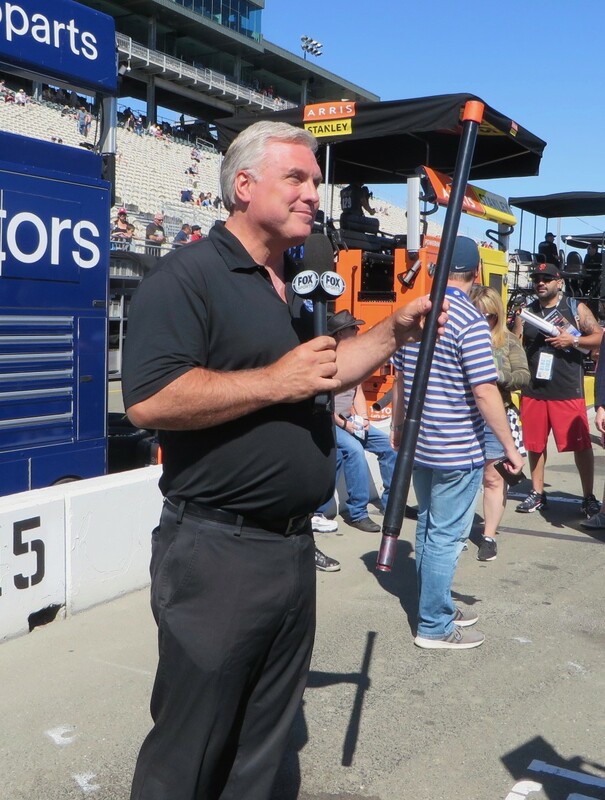 Defending Series Champion, Josef Newgarden/No.1 Verizon Team Penske Chevrolet had to sit out the final ten minutes of the 45-minute session, for hitting personnel during the Friday Pit Stop Practice. He will also be assessed a post-race monetary fine. 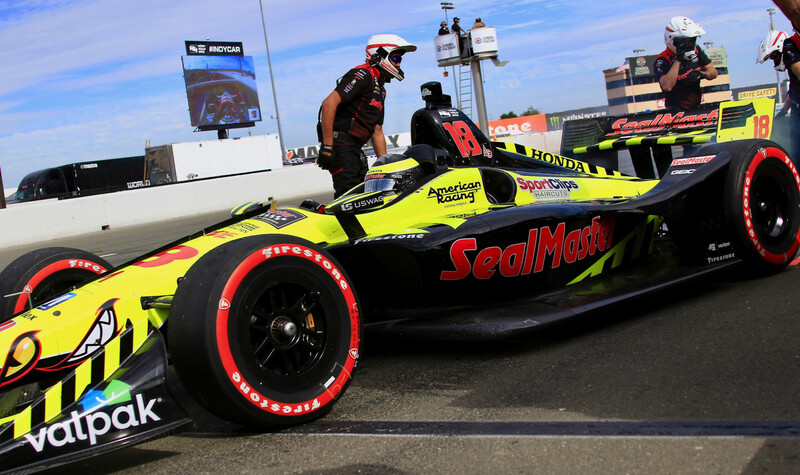 Sebastien Bourdais/No.18 SealMaster Dale Coyne Racing Honda had a mechanical problem and ended his session with 12 minutes remaining. He was 25th in practice. 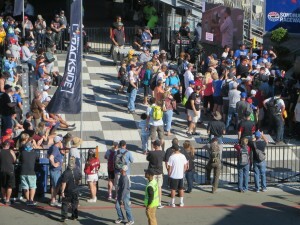 There is a lot of spectator interest in the Historic Trans-Am. 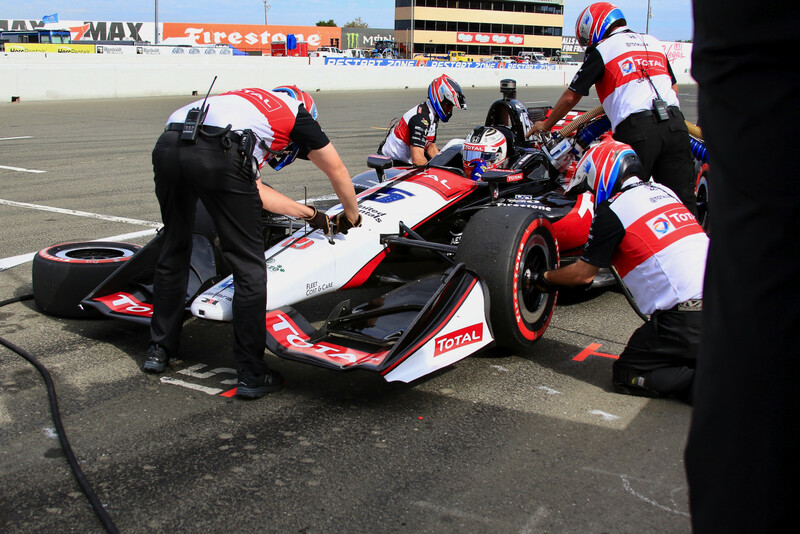 Those devout IndyCar fans who went to the Long Beach race saw this group of ground-pounders, which calls itself the closest racing series in the world. The Pre-Grid Saturday morning for the practice session was lined on both sides with fans with cameras and phones taking videos and photos. 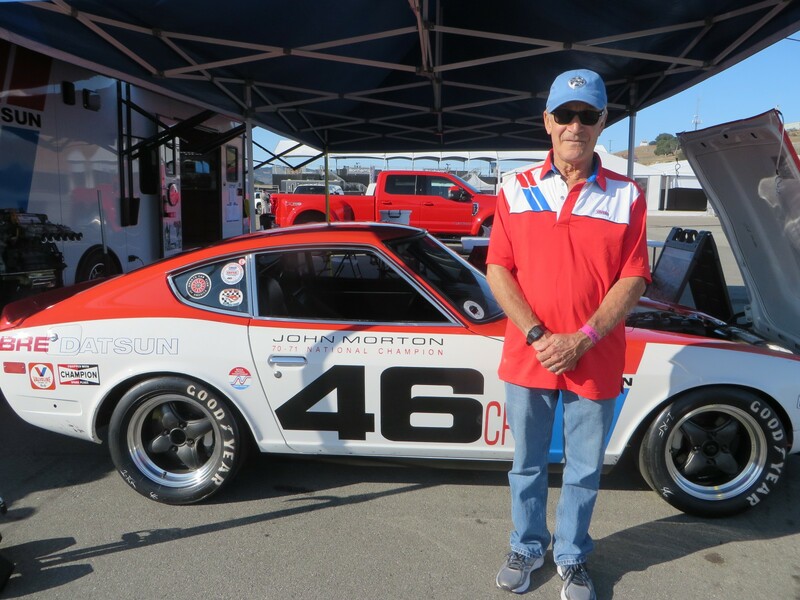 Jimmy Hague, driving the iconic red/white/blue No.2 1972 American Motors Javelin had the pole position for Saturday afternoon’s Historic Trans-Am race. His qualifying lap was 1:55.845. 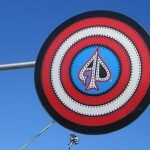 Twenty-one of the 23 entries qualified. The race was exciting, with the lead changing almost lap by lap. There was an ongoing battle between Hague, John Hildebrand/No.49 1964 Pontiac Tempest, Jim Halsey/61 1970 Ford Mustang Boss 302, and Ken Adams/No.45 1969 Ford Mustang Boss 302. All four led at least once during the 10-lap race. In the end, it was a photo finish, with Adams taking the win, a mere 0.074 seconds ahead of Hague. Halsey was third, with Hildebrand in fourth and Drew Alcazar/No.70 1969 Ford Mustang Boss 302 coming in fifth. This group will have a second race Sunday right before the IndyCar Pre-Race Ceremonies. First thing Saturday morning the IndyCar drivers had its autograph session, and fans queued up in the chilly morning sunshine. 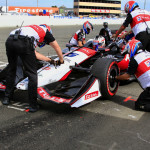 Josef Newgarden/No.1 Verizon Team Penske Chevrolet recovered enough from his food poisoning and missing the entire first session to top the charts Friday afternoon at Sonoma Raceway in the hour-long practice for the Verizon IndyCar Series. 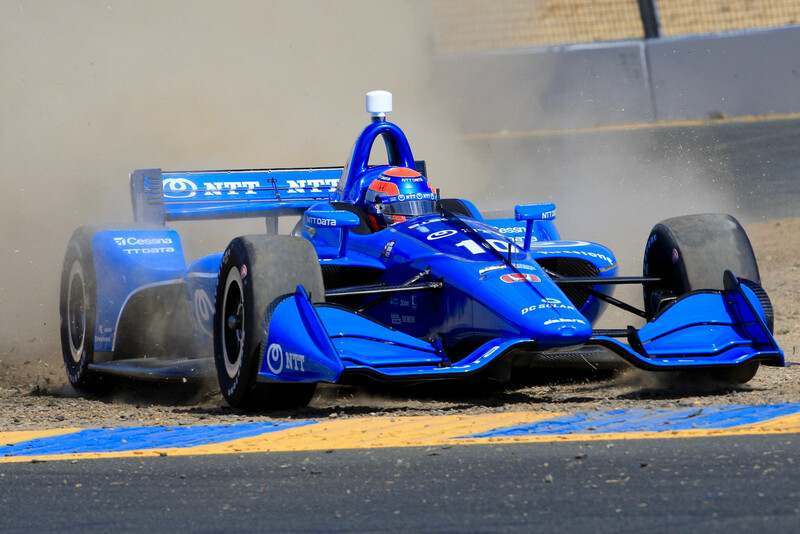 The 2017 IndyCar champion was able to bounce back from his illness and fuel management problem in the morning to quick-step around the course at 1:17.8156 – not quite as fast as the morning time set by Ryan Hunter-Reay/No.28 DHL Andretti Autosport Honda, but fast enough. 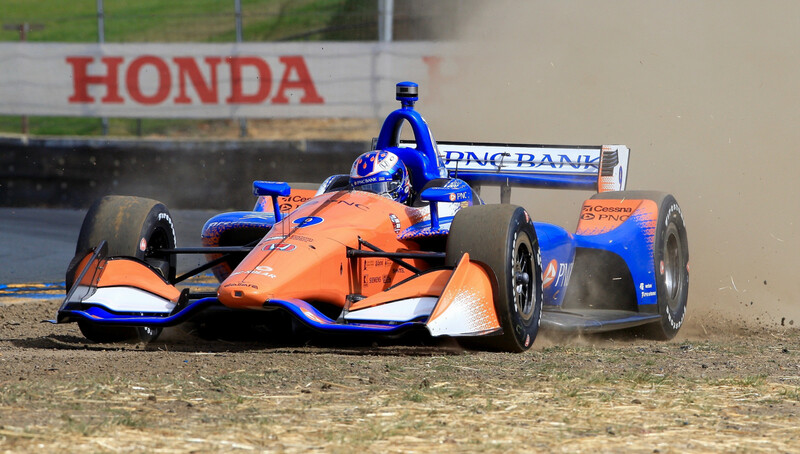 Second through fifth were Scott Dixon/No.9 PNC Bank Chip Ganassi Racing; Rookie Patricio O’Ward/No.8 Harding Group Honda; Will Power/No.12 Verizon Team Penske Chevrolet; and James Hinchcliffe/No.5 Arrow Electronics SPM Honda. 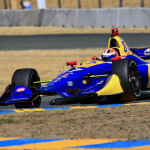 Alexander Rossi/No.27 NAPA AUTO PARTS Andretti Autosport Honda had a brief moment of testing track limits, as did Ed Jones/No.10 NTT Data Chip Ganassi Racing Honda in Turn 7. His off caused a Red Flag of 2.14 minutes. Rossi ended up sixth, and Jones was seventh for the session. 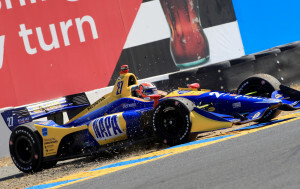 Among other leaders during the session were Rookie Santino Ferrucci/No.39 Cly-Del Dale Coyne Racing Honda; Alexander Rossi/No.27 NAPA AUTO PARTS Andretti Autosport Honda; and O’Ward. O’Ward was the top Rookie of the session, and also top Rookie for the day. 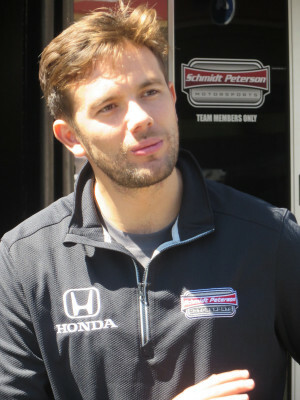 He is the current Indy Lights Champion, winning that title after his ninth series victory in Portland, from the pole. As Champion he will receive $1 million towards an IndyCar ride, including the Indianapolis 500. 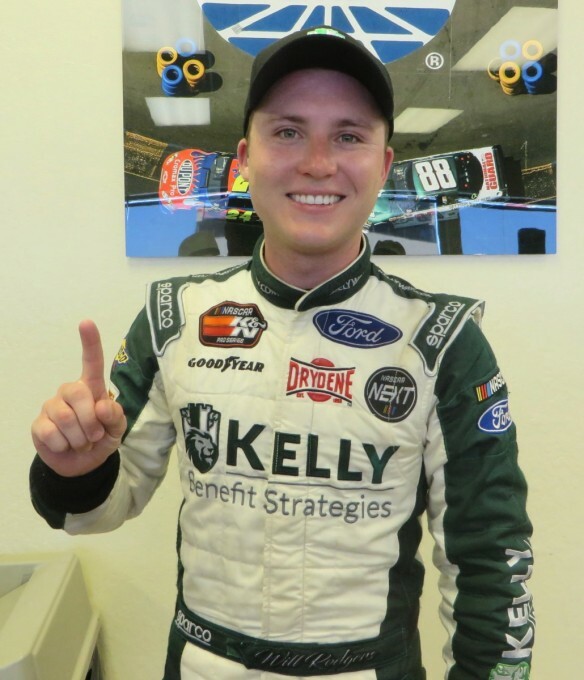 This weekend he and his Lights teammate, Colton Herta, are racing Chevrolets with Harding Group Racing. Herta was Lights runner-up in a tightly-contested season. The hour-long practice session was followed by a 15-minute Pit Stop practice session. 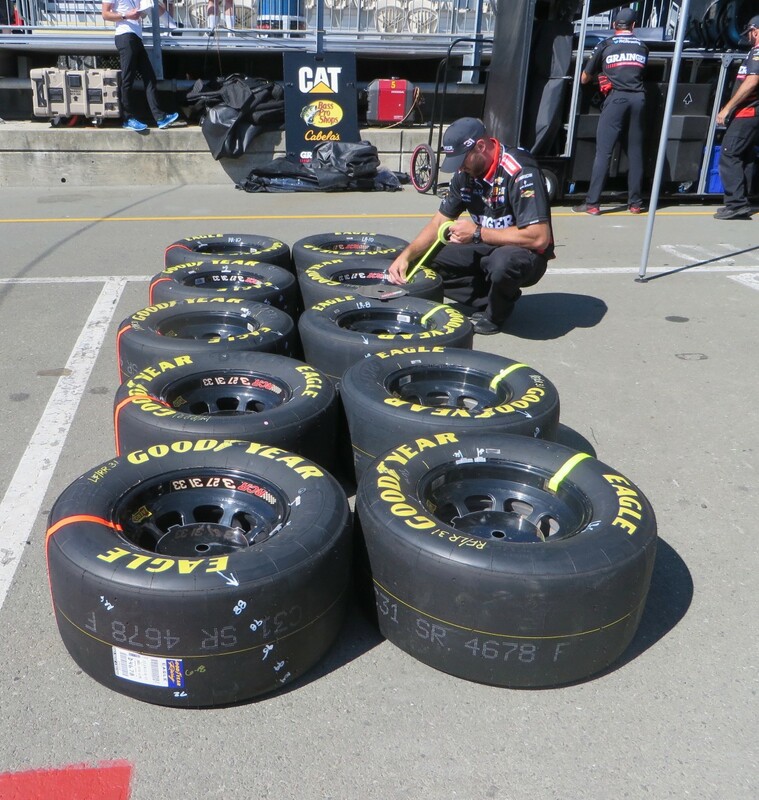 The drivers would do slow laps around the course and come in for the practice pit stops. This is not to be confused with the Pit Stop Challenge competition held prior to the Indianapolis 500 race. Left to Right: James Hinchcliffe/No.5 SPM Honda; Graham Rahal/No.15 RHL Honda; and Sebastien Bourdais/No.18 Dale Coyne Racing Honda. Photos by Nico Matamoros. 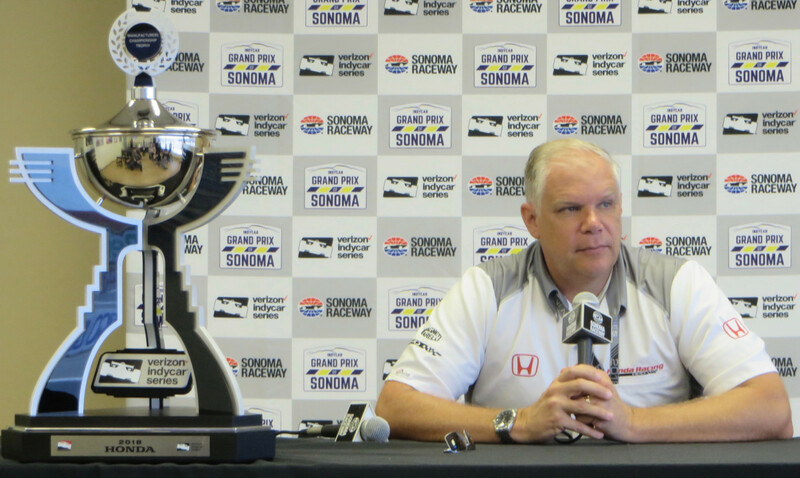 Art St. Cyr, President of Honda Performance Development, met with the media and showed off the 2018 Manufacturer’s Championship Trophy that Honda won this year. Overall, the moderator said it was a pretty successful season. 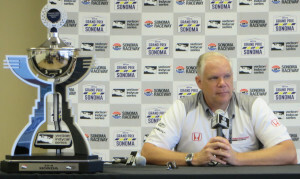 St. Cyr said “I can’t say it’s ultimately successful because we did not win the Indy 500 this year. Winning 10 of the first 16 races has been really good. It was nice to have clinched the manufacturer’s championship at Gateway, so it’s allowed us to really focus on the driver championship, which for yet another year is coming down to the last race here in Sonoma. It should be pretty exciting. “We have two horses in the race, right, with Scott and Alexander fighting against Will and Josef. I definitely like our position better than their position for this one. You definitely want to be in front coming into the last race. Still have to execute. The season finale race for the Verizon IndyCar Series at Sonoma Raceway is also the last IndyCar race, at least for now, for the wine country race track. 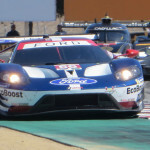 Next year the season finale race will be held at WeatherTech Raceway Laguna Seca, and Sonoma will not be on the schedule. This ends a run of 14 years for the 2.385-mile IndyCar-configured elevated road course. The first race in 2005 was won by Tony Kanaan. 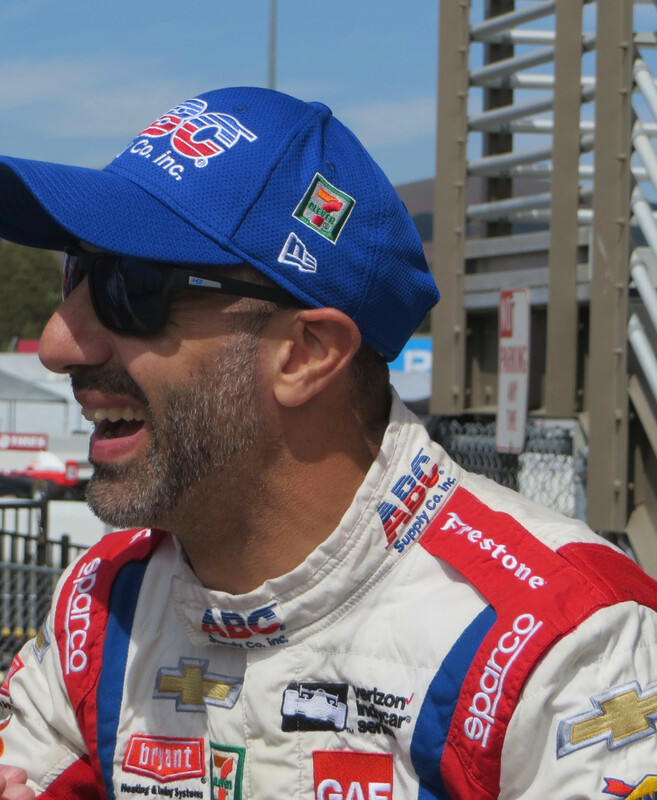 This weekend Kanaan, who admits to being nearly 44 years old, is Kanaan’s 300th consecutive indycar race. He said he’s growing a beard this weekend, to show people that “so people can see that I’ve got some gray on my 300th start.” Two current IndyCar drivers in that inaugural 2005 IndyCar race were Scott Dixon and Ed Carpenter. That race also included Bryan Herta, whose son Colton Herta is racing here this weekend as a Rookie for Harding Group Racing in No.88 Honda. Kanaan used to be racing teammates with Bryan Herta and Kanaan was Colton first sponsor when he started go-kart racing. 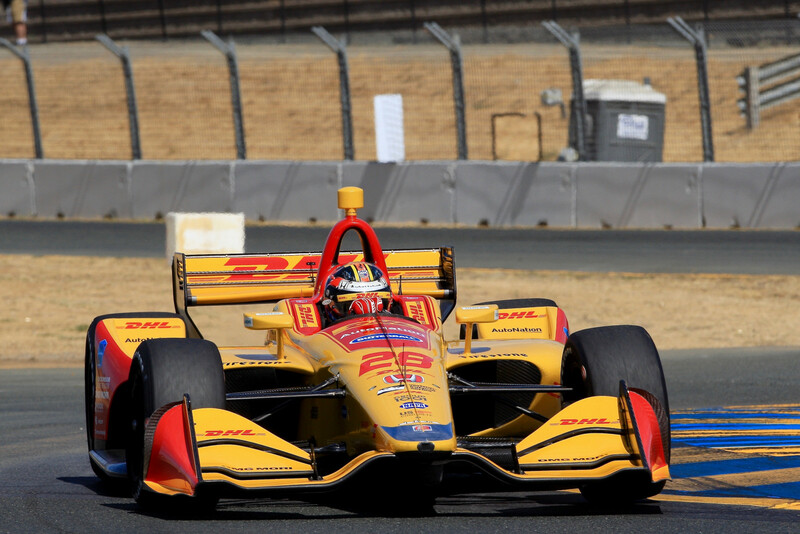 Ryan Hunter-Reay/No.DHL Andretti Autosport Honda was the fastest Verizon IndyCar Series driver Friday morning at Sonoma Raceway. His lap was 1:17.5742. Second through fifth were Scott Dixon/No.9 PNC Bank Chip Ganassi Racing Honda; Will Power/No.12 Verizon Team Penske Chevrolet; Simon Pagenaud/No.22 DXC Technology Team Penske Chevrolet; and Marco Andretti/No.98 U.S. Concrete/Curb Andretti Autosport Chevrolet. Zach Veach/No.26 1001 Group Andretti Autosport Honda was the top Rookie, in ninth place, with a time of 1:18.3541. He set that time in the morning ‘Rookie’ practice, ahead of six others in that session. The Rookie drivers who were ‘auditioning’ acquitted themselves nicely, staying out of trouble. The two Dale Coyne Honda drivers – Pietro Fittipaldi/No.19 and Santino Ferrucci/No.39 – were 11th and 12th, respectively. 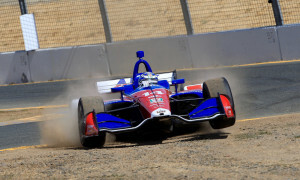 The two Harding Group Honda drivers – Colton Herta/No.88 and Patricio O’Ward/No.8 – were 16th and 24th, respectively. Carlos Munoz is driving the No.6 Lucas Oil SPM Honda, filling in for the recovering Robert Wickens. 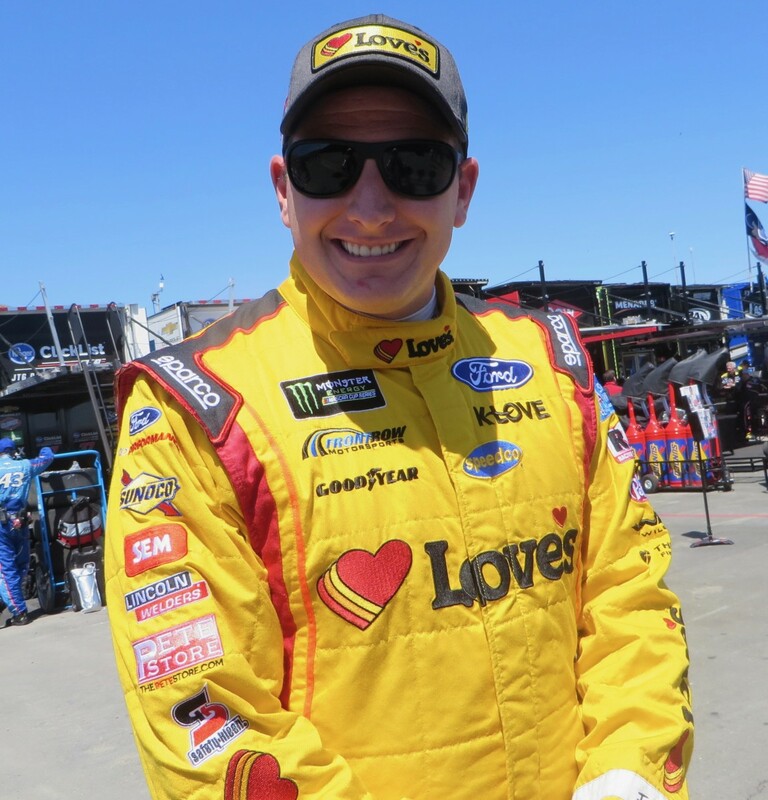 The Canadian driver was injured in a horrific accident during the Pocono weekend, suffering massive injuries, and is currently rehabbing in Indianapolis. We all wish him a speedy recovery. 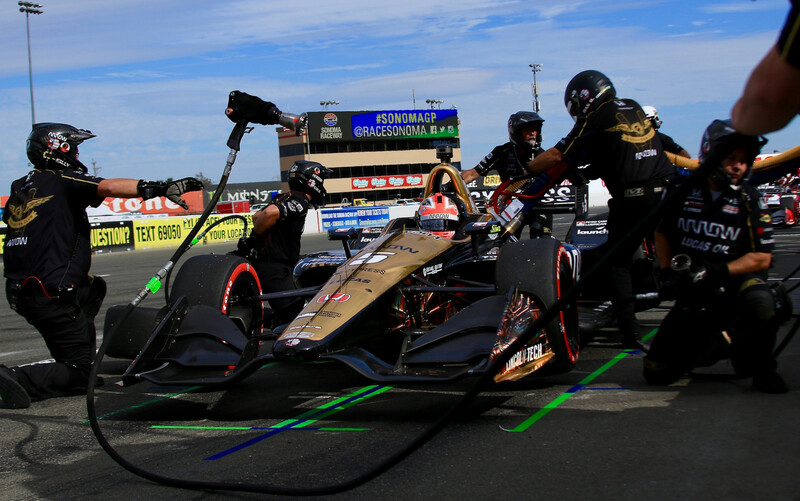 Wickens was declared the Sunoco Rookie of the Year after the last (Portland) race despite competing in only 14 of 16 races to that point. He amassed so many points, there was no way the other two full-time Rookies – Veach and Matheus Leist/No.4 ABC Supply AJ Foyt Racing Chevrolet – could catch him. One driver didn’t go out, but not for lack of trying. 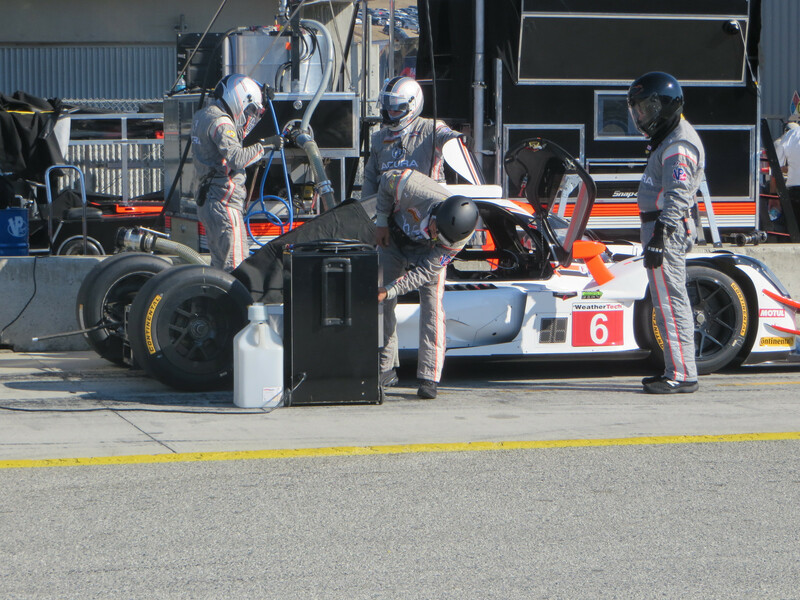 Josef Newgarden/No.1 Verizon Team Penske Chevrolet was in Pit Lane, but the car wouldn’t start … fuel pickup problem. 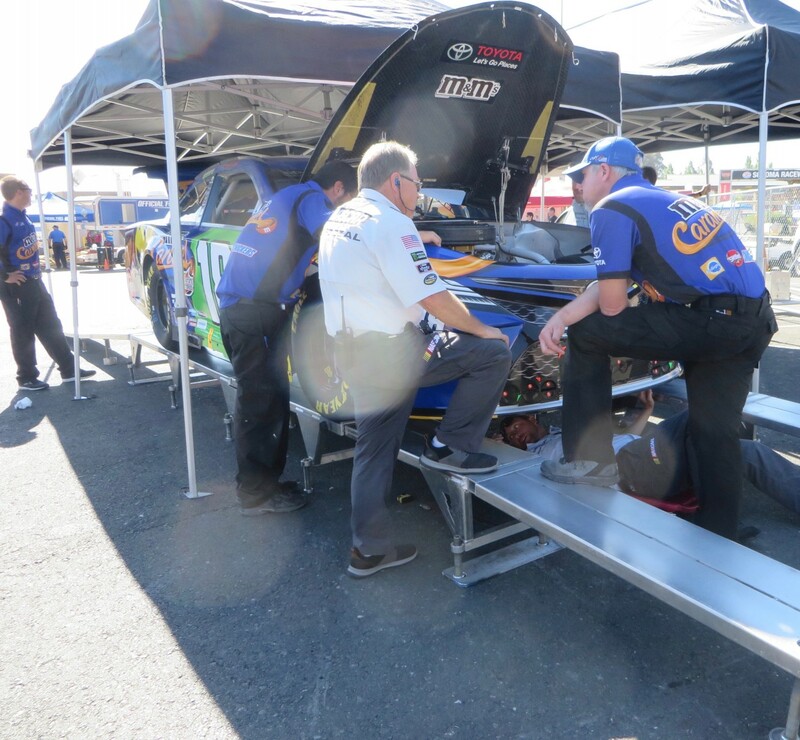 The team said it was “a minor non-engine mechanical issue.” It took longer to remedy than that, but all’s well…with the car. Not with Newgarden. He has food poisoning and is not feeling well at all. 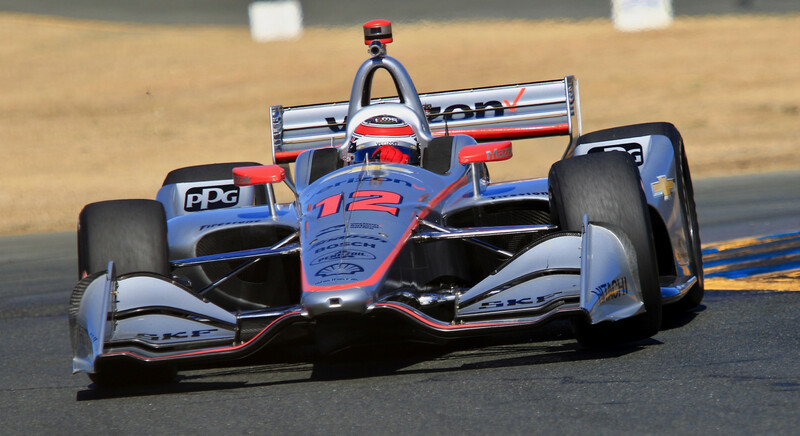 Newgarden is one of four drivers mathematically able to win the 2018 Championship this weekend, a double points race – he and Penske teammate, Will Power/No.12 have to basically win their race from the pole, lead the most laps, and for the two top contenders to have a bad weekend. Newgarden concedes this will be a difficult scenario. 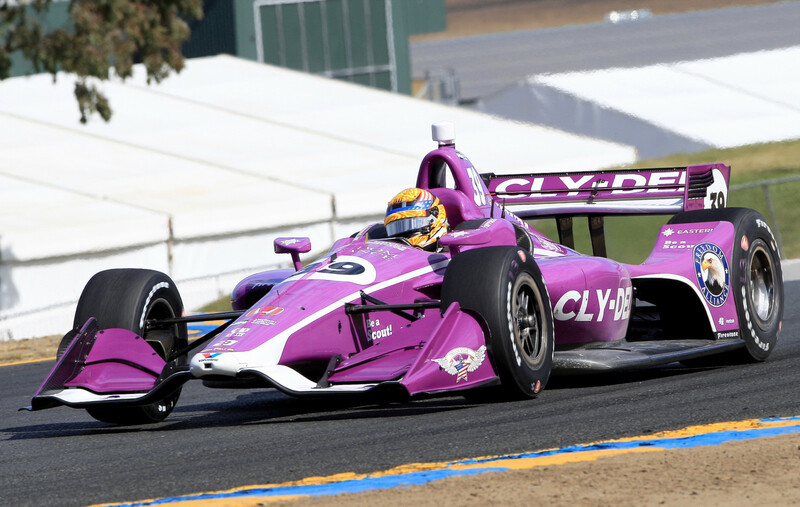 Dixon is the current leader in the Driver Standings, 29 points ahead of Alexander Rossi/No.27 NAPA AUTO PARTS Andretti Autosport Honda. They are basically the contenders for this year’s championship. 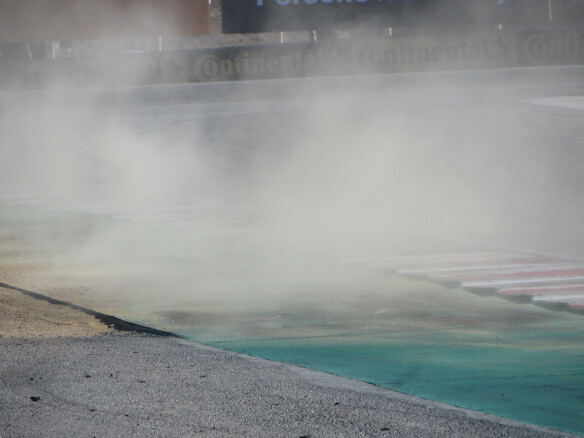 Rossi spun out over the rumble strips in Turn 10, saved it and pitted. Rossi was eighth in the session. Kanaan did a couple of short cuts across dirt, sort of agricultural racing. He was nineteenth for the session. Hinchcliffe went off in Turn Two, into the tire wall right side. 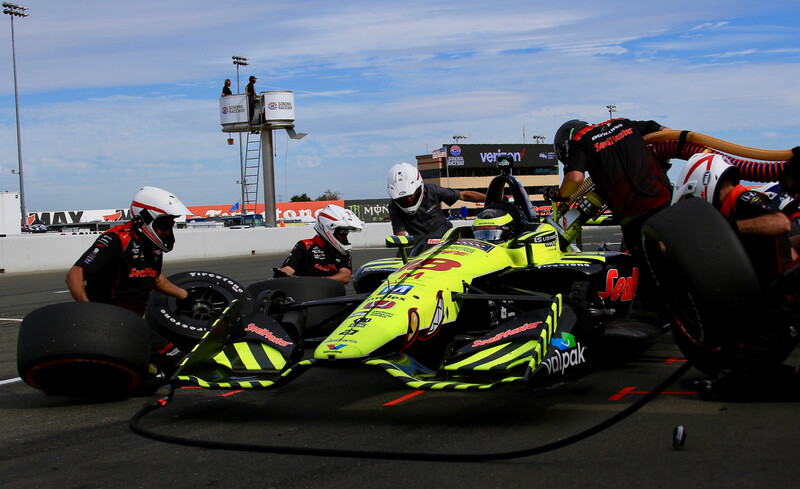 It wasn’t a hard hit and once pulled out and the tires cleaned off car checked by AMR IndyCar crew, he drove it in, scrubbing the tires at first and then stepping quite quickly to the pits. The accident was similar to an earlier Formula Car incident by Bill Weaver/No.67. Both drivers were alright and suffered only minimal body damage; but both incidents caused a session-stoppage. In Hinchcliffe’s situation, it was a Red Flag for 4:13 minutes. Other leaders in the session included Graham Rahal/No.15 TOTAL Rahal Letterman Lanigan Racing Honda. IndyCar has a second practice session Friday afternoon. Also on the weekend schedule are the IMSA Porsche GT3 Cup Challenge Series, Formula Car Challenge Series, and Historic Trans-Am Series. 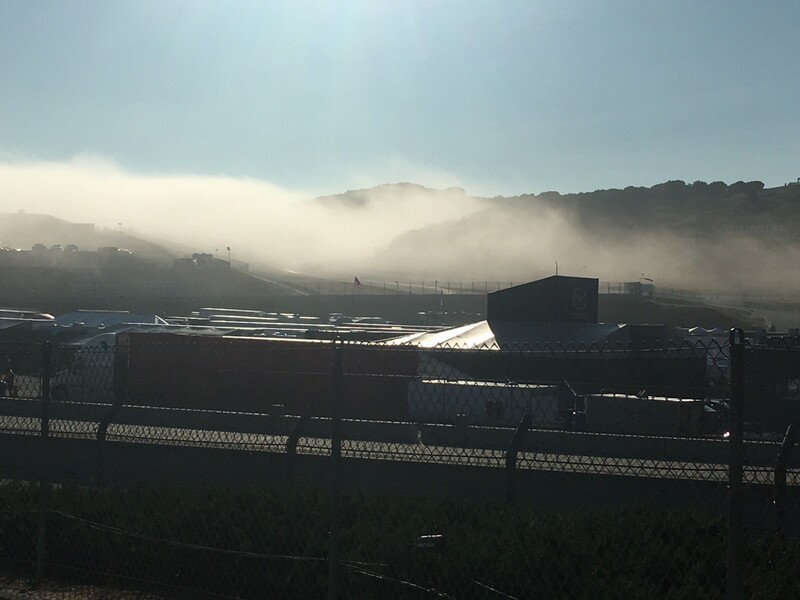 Saturday at WeatherTech Raceway at Laguna Seca, it was sunshine from the moment the sun crested over the Turn Nine hill and bathed the paddock in light, bringing out the shades at 7:30am. Today there is more practice, an 8am warm-up for a 5:45pm race, qualifying and three races. Busy Day! The day started out frisky and none of the morning sessions went uninterrupted. The drivers kicked up their heels … and a lot of dust and gravel. The corner workers got a work out with a rainbow of flags – Red, Yellow, Green, Blue, Yellow/Red, and White. The SFR E Crew were kept busy retrieving. 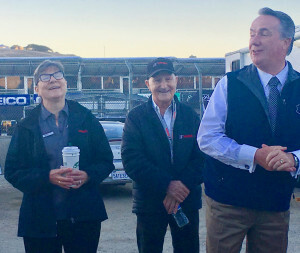 SCRAMP (Sports Car Racing Association of Monterey Peninsula) CEO, Tim McCrane and IMSA Driver Advisor, Elliot Forbes-Robinson visited, amused and educated us at the 7am morning meeting of the SFR SCCA Flagging & Communications Crew, with IMSA Official, Jo Ann Jensen, Jim Swintal, Pirelli Porsche Race Director Randy Buck and Driver Coach, Craig Stanton. Lots to go over with all the IMSA rules, ways and means. 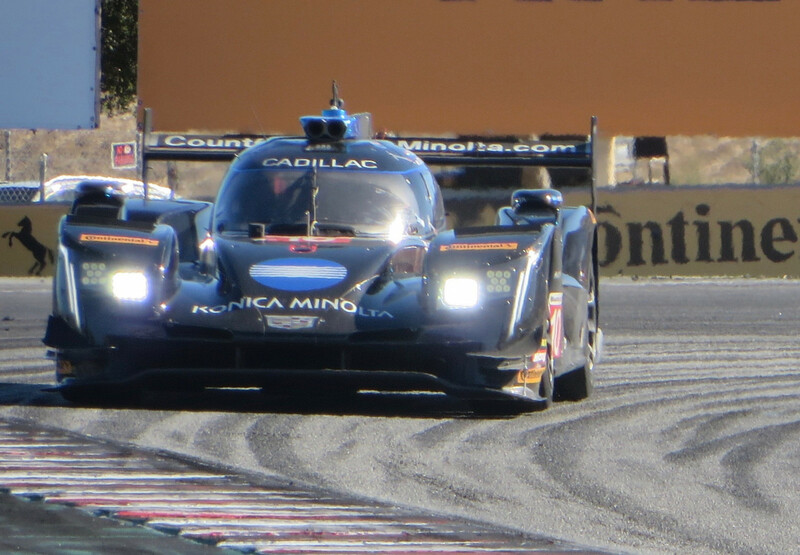 In IMSA WeatherTech Qualifying, Jordan Taylor/No.10 Konica/Minolta Cadillac has the pole position for Sunday’s America’s Tire 250 Race for the IMSA WeatherTech SportsCar Championship. His lap was 1:16.181/105.758, a new track record – breaking the one set last June by his brother, Ricky Taylor – 1:16.853. There are thirteen Prototypes in the race. 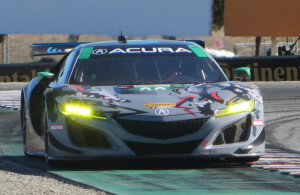 This was Jordan’s tenth (or 11th) IMSA pole, his second WeatherTech Championship pole, and his first pole at this Laguna Seca track since 2015. 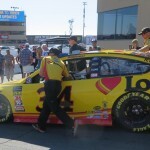 The team hasn’t won at Laguna Seca since 2013. 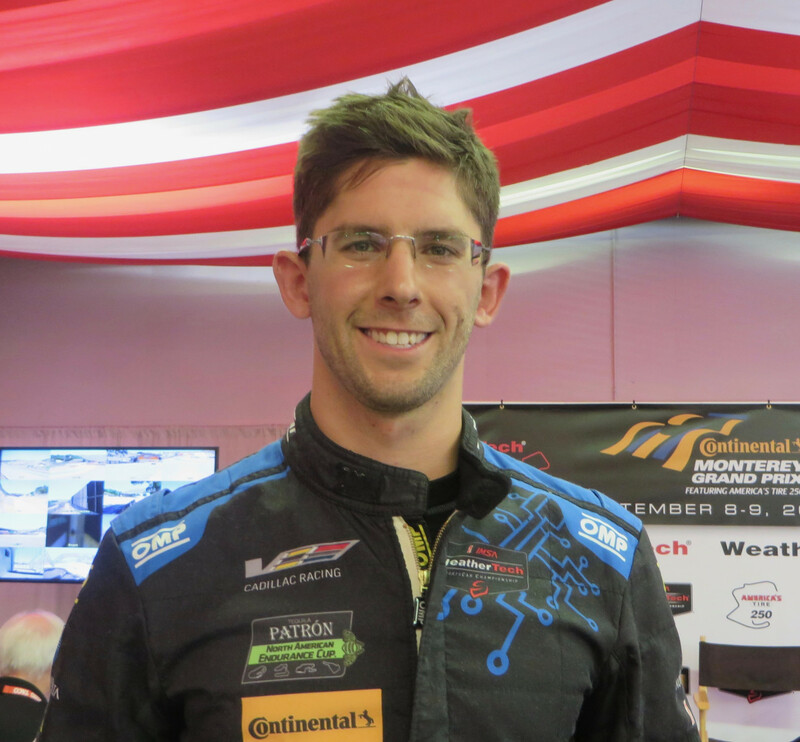 Jordan and teammate Renger Van Der Zande are fourth in the Driver standings. 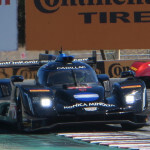 Cadillac is leading the Prototype Manufacturer Standings. Thirty-four drivers qualified. Oliver Gavin/No.4 Corvette Racing Corvette C7 R took the GTLM pole position ahead of seven competitors. It was his first-ever pole position at WeatherTech Raceway Laguna Seca. He’s had more than 50 career poles in various series. 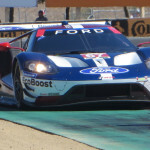 For awhile during the fifteen-minute Qualifying session, he and teammate, Jan Magnussen/No.3 were 1-2, before Dirk Mueller/No.66 Ford Chip Ganassi Racing Ford GT inserted himself to be the filling in a Corvette sandwich. 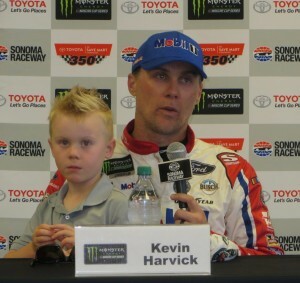 Gavin is the ninth different driver to get the pole position in ten races. 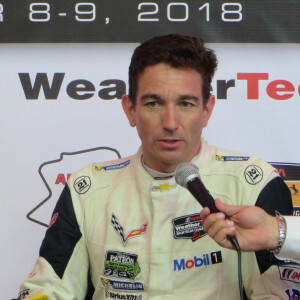 He and teammate, Tommy Milner are fourth in the GTLM Driver standings with 252 points.Their fellow Corvette, No.3 with Antonio Garcia and Jan Magnussen, is leading the standings with 269 points. 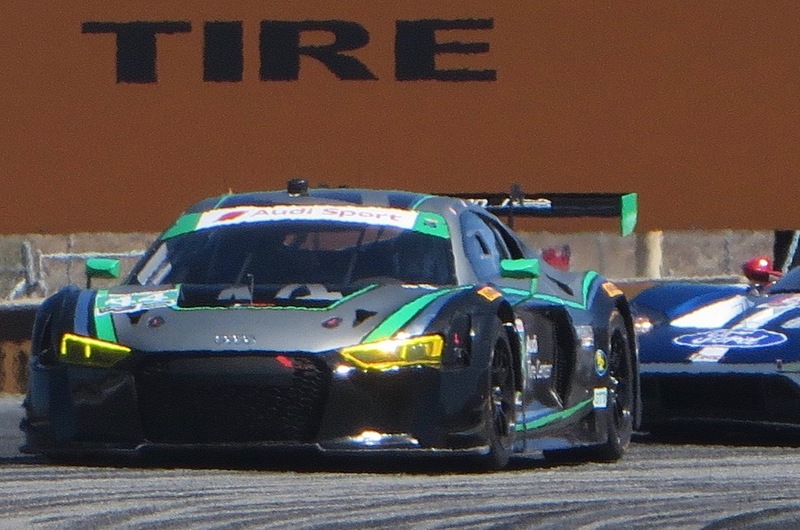 Gavin and Milner won their 2015 IMSA class at Laguna Seca in 2012. Gavin said “It was nice to get back to P1. It’s always great to get pole position here at Laguna Seca. Thanks to everyone at Corvette Racing and the crew. It takes a massive effort from everyone on the team to get back to P1. It’s nice to have this moment for the guys on our team. It gives everyone a nice little fill-up going into the race tomorrow. “I’m thrilled, but this is only a small step in trying to achieve what we want to achieve tomorrow, and that’s a victory. Once the green flag drops tomorrow, this is all kind of forgotten. We have a very good race car; obviously it fell in nicely for qualifying. 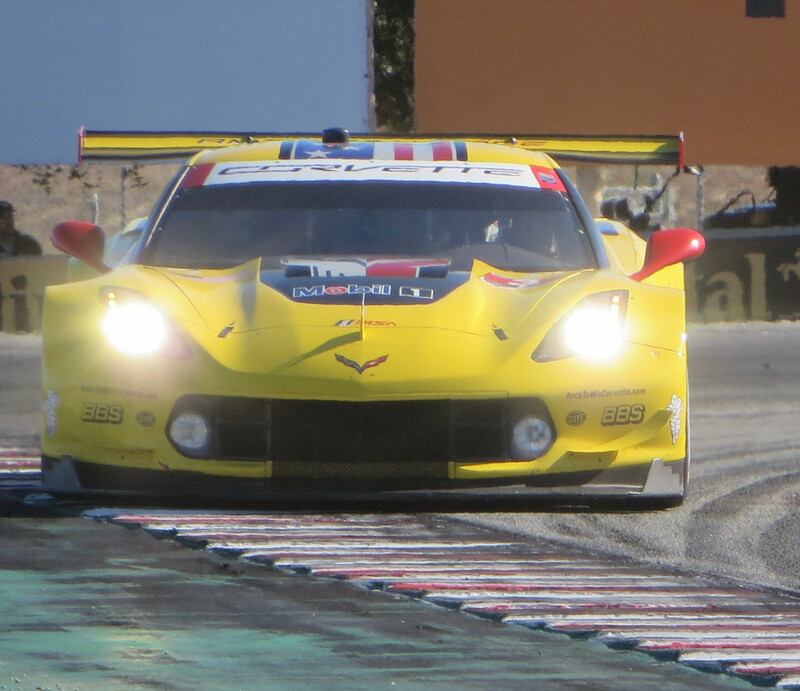 The Corvette C7.R has been strong all year. We’ve had an amazing team, great strategy and pit stops. We just need to execute tomorrow. The competition is at an all-time high in GTLM, and to be able to beat those guys is pretty satisfying. But the real work is ahead for tomorrow. “We’ll be pushing like crazy at the start and we’ll work hard tonight to make sure we have everything covered and we’re fully prepared for the race. Legge is in a tights point battle with Bryan Sellars and Madison Snow in No.48 Paul Miller Racing Lamborghini Huracan GT3. Sellars and Snow are 18 points ahead of Legge. Her co-driver, Alvaro Parente is further behind in the standings. 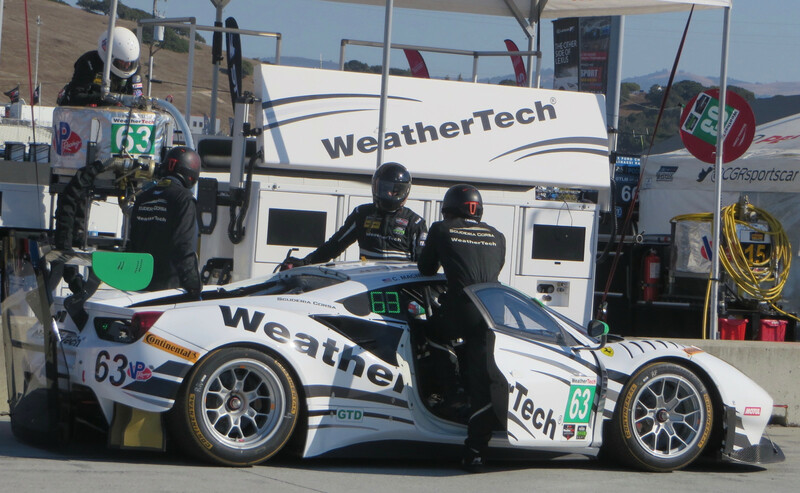 IMSA WeatherTech sportscars had an hour-long morning practice. Ranger Van Der Zande/No.10 Konica/Minolta Cadillac was the fastest overall and the fastest Prototype, narrowly shading his Friday fastest overall time, to clock a 1:16.605/105.172 mph. His co-driver is Jordan Taylor. The No.911 Porsche Team Porsche 911 RSR with Patrick Palet and Nick Tandy was quickest in the GTLM Class, at 1:22.839/97.258 mph. The No.58 Wright Motorsports Porsche 911GT3 R driven by Patrick Long and Christina Nielsen was tops in GTD, at 1:24.619/95.212 mph. The Red Flag lasted most of the race, which featured driver changes. The race restarted, there were driver changes, and then another incident so the Pace Car took the Checkered Flag ahead of Pro Driver, Taylor Prolo/No.50 US Race Tronics. His co-driver is Edoardo Piscopo, who qualified the car. Trent Hindman/No. 1 Wayne Taylor Racing turned the fastest lap in the class at 1:25.651. Unfortunately he and co-driver Johnny Cecotto DNF. Brian Thiennes/No.17 US Race Tronics won the Am Class, driving alone. He finished sixth overall. Damon Ockey/No.09 US Race Tronics turned the fastest class lap of 1:27.302. Mark Proto and Parris Mullens won the LB Cup Class, finishing eighth overall. Brett Meredith/No.66 P1 Motorsports drove alone and turned the fastest class lap of 1:27.776. Fourteen drivers finished the race, with 13 on the lead lap. Only 15 laps were completed in the 50-minute race, due to the half hour or so Red Flag time. 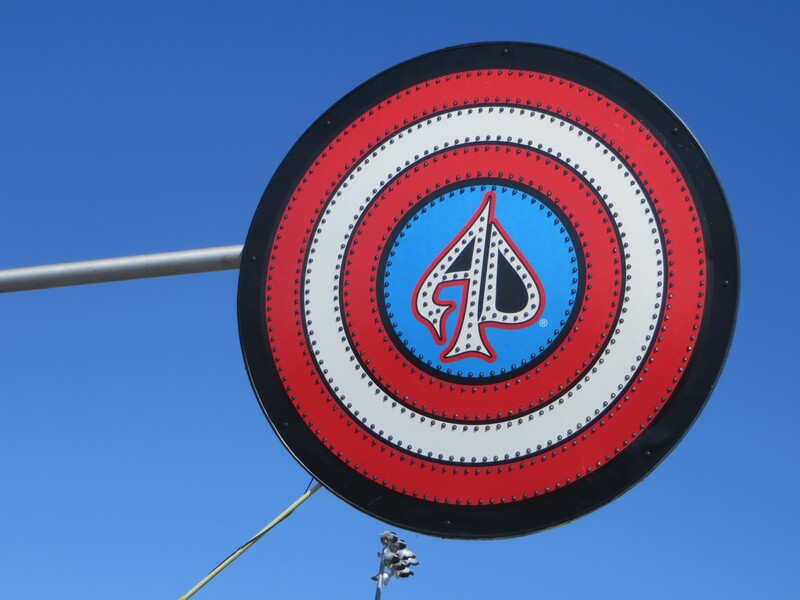 Two drivers were penalized time for short pit stops – No.67 PPM in the Am class and No.71 P1 Motorsports in the ProAm class. Next up the two-hour race for IMSA Continental Tire SportsCar Challenge and 45-minute race for Pirelli Trophy West U.S.A. 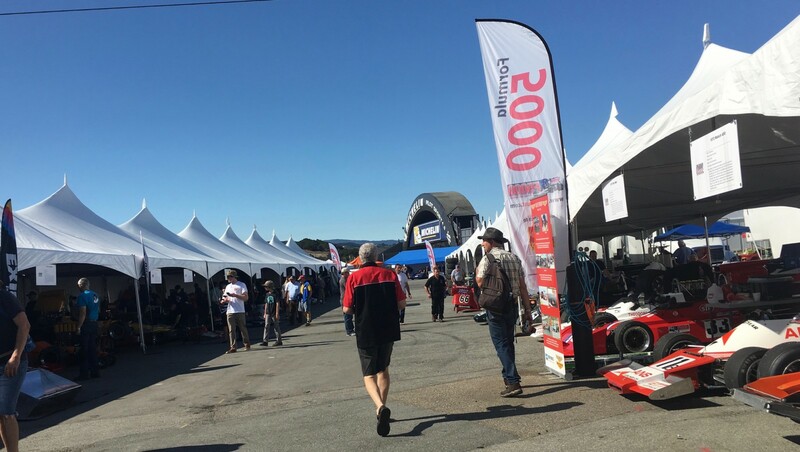 Despite the ground hugging fog greeting early arrivers at WeatherTech Laguna Seca Friday morning for the Continental Monterey Grand Prix, the schedule started on time with Porsche Pirelli Trophy West U.S.A. The drive into the track on South Boundary Road was downright scary, but upon cresting the hill overlooking the paddock it was clearer…enough so that it was picturesque but clear enough to race. It soon lifted and the sun shone, with blue skies and light breezes. It was low seventies, warmer than Thursday. Four series are competing this weekend – IMSA WeatherTech SportsCar Championship, IMSA Continental Tire SportsCar Challenge, IMSA Lamborghini Trofeo, and Porsches. Friday calls for Practice for all, and Qualifying for Lambos and Porsches. The IMSA race has been held at Laguna Seca 1974 when it held the Inaugural Monterey Triple Crown. Just now “experts from USA Today and fans” voted the Continental Monterey Grand Prix the fifth Best Motorsports Race in the World, behind such International events as the Indianapolis 500, Daytona 500, Monaco Grand Prix and 24 Hours of Le Mans. This race on the iconic 2.238-mile elevated road course is traditionally the penultimate race of the IMSA season. Ten International races made the list, and the only other American venue besides Daytona was the USGP at COTA. Next year the fiftieth Anniversary of IMSA will be celebrated as the featured marque at the Rolex Monterey Motorsports Reunion. 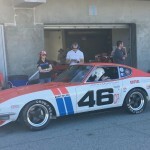 Several of the sessions were punctuated with Red Flags to bring in the cars, while their fellow competitors were being retrieved out of gravel pits mostly in Turns Two and Eight/Corkscrew area. 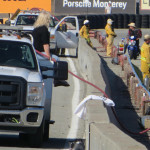 The lunch-time on-track activities were mostly canceled so that track maintenance could be performed in the Corkscrew area, removing three Dissuaders after one was taken out at Turn Eight. The Konica Minolta Cadillac No.10 DPi was the fastest WeatherTech IMSA Prototype and overall sportscar in the morning practice, with drivers Roger Van Der Zande and Jordan Taylor, turning a 1:16.882/104.794 mph. 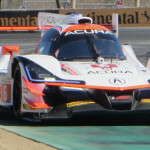 Second and third Protytpes were Dane Cameron & Juan Pablo Montoya/No.6 Acura Team Penske Acura DPi; and Johannes van Overbeek & Pipo Derani/No.22 Tequila Patron ESM Nissan DPi. 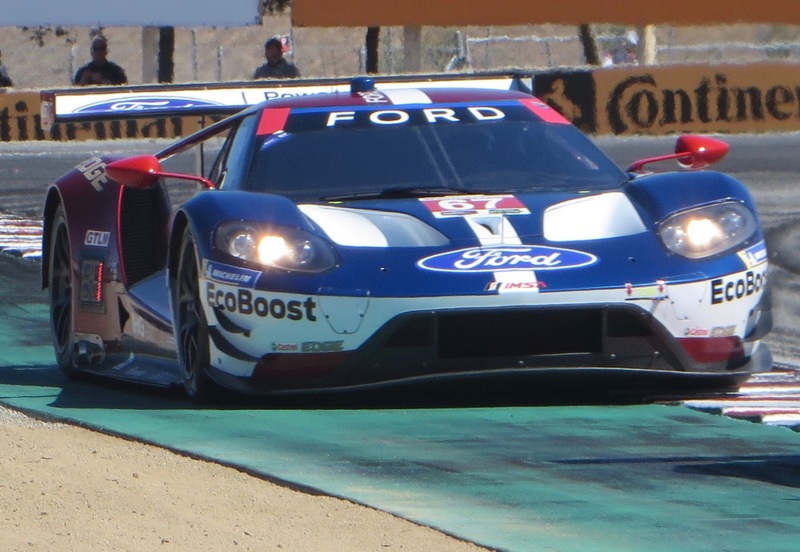 In the GTLM class, Ryan Briscoe and Richard Westbrook were fastest in No.67 Ford Chip Ganassi Racing Ford GT at 1:23.644/96.322 mph. Second and third were Joey Hand & Dirk Mueller in the No.66 team Ford GT; and Earl Bamber & Laurens Vanthoor/No.912 Porsche GT Team Porsche 911. Bryan Sellers and Madison Snow were the top GTD team in No.48 Paul Miller Racing Lamborghini Huracan GT3 at 1:25.403/94.338 mph. Second and third in class were Ben Keating & Jeroen Bleekemolen/No.33 Mercedes-AMG Team Riley Motorsports Mercedes; and John Potter & Andy Lally/No.44 Magnus Racing Audi. Left to Right: No.10 Konica Minolta Prototype Cadillac; No.67 Ford Chip Ganassi Racing GTLM Ford GT; and No.38 GTD Paul Miller Racing Lamborghini. 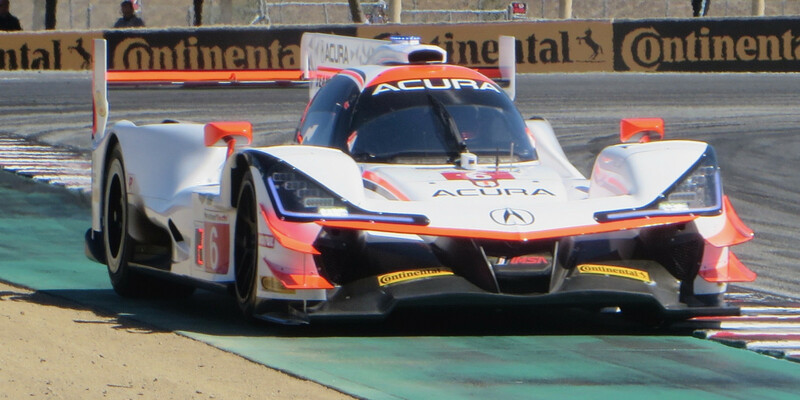 In the afternoon Dane Cameron/No.6 Team Penske Acura pipped his teammate,Helio Castroneves/No.7 Team Penske Acura at the very last minute – literally, with a time of 1:16.885 – just barely not quite as fast as the Konica Cadillac from the morning session. 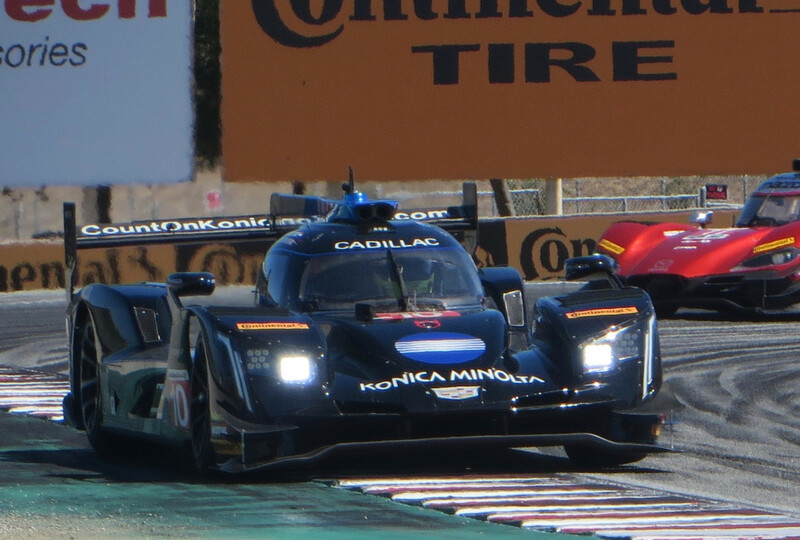 Castroneves was second in the afternoon, with No.5 Mustang Sampling Cadillac in third with Filipe Albuquerque and Joao Barbosa. 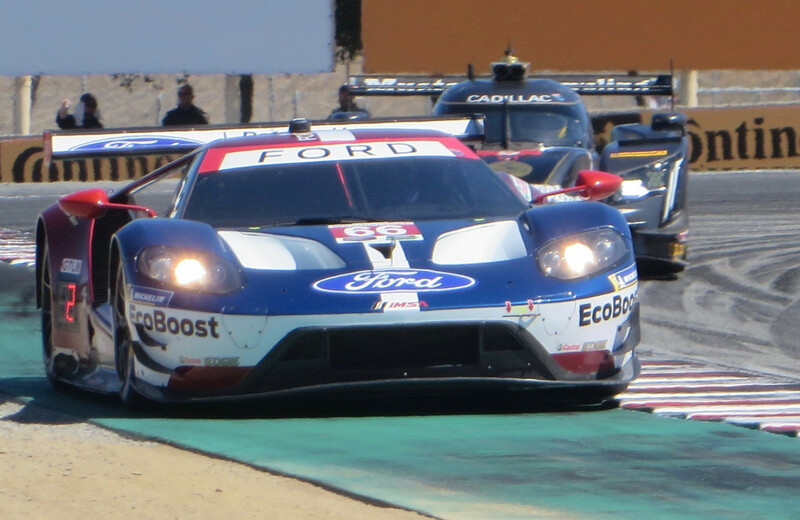 In the GTLM class, the No.66 Ford Chip Ganassi Racing Ford GT was tops with Joey Hand & Dirk Mueller at 1:23.427/96.670 mph. Second and third in class were teammates Briscoe and Westbrook in No.67; and Oliver Gavin & Tommy Milner/No.4 Corvette Racing Corvette. Park Place Porsche was the fastest GTD team with drivers Patrick Lindsey and Joerg Bergmeister in No.73 Porsche at 1:25.148/94.620mph. Left to Right: Dane Cameron/No.6 Prototype Acura; No.66 GTLM Ford Chip Ganassi Racing Ford GT; and No.73 GTD Park Place Porsche. Watching this group go through the Turn One radar trap near the end of the first hour-long session, I saw 149 mph pop up on the cross-over bridge sign. 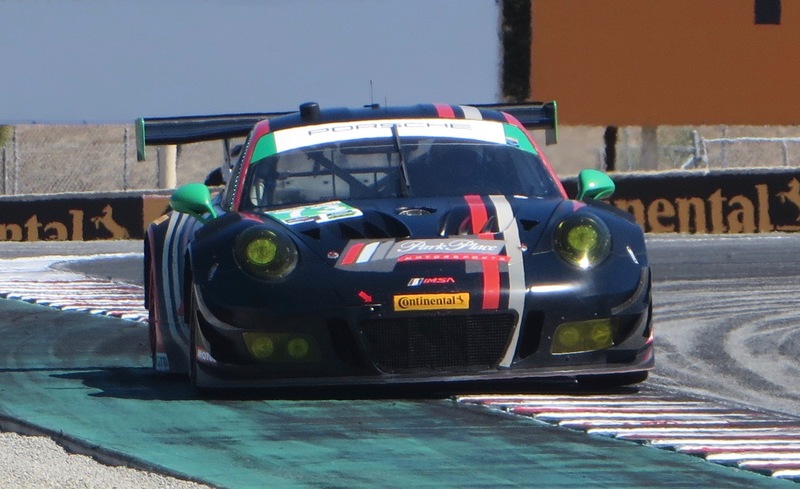 In the Continental Challenge Group, practicing for Saturday’s WeatherTech Raceway Laguna 120 race, Gary Ferrera and Kris Wilson were fastest overall in the morning session and in the Grand Sport Class at 1:33.123/86.517 mph in No.99 Automatic Racing Aston Martin. Second and third in GS were Dillon Machavern & Spencer Pumpelly/No.28 RS1 Porsche Cayman; and Alan Brynjolfsson & Trent Hindman/No.7 Multimatic Motorsports Ford Mustang. Quickest in the Touring Car Class were Roy Block and Pierre Kleinubing/No.75 Compass Racing AudiRS3 at 1:35.501/84.363 mph.Second and third in TCR were Russell Ward & Damien Faulkner/No.33 Winward Racing/HTP Mercedes AMG and Robin Liddell & Andrew Davis/No.71 Rebel Rock Racing Camaro. Mike LaMarra and Matt Pombo were the fastest of the Street Tuner class cars,in No.73 MINI USA Mini JCW, at 1:39.853/80.686 mph. Second and third were Nick Galante and Devin Jones in No.81 Veristor/Logistics BMW; and Colin Mullan & Mark Pombo in No.52 Mini USA JCW. The Porsche group was the largest field, with 38 entries. They have six categories within the series: Diamond, Diamond Masters, Platinum, Gold, Bronze and Silver. In the first practice, Michael Zukeack/No.2 GT3 Cup was fastest overall and in Diamond Master at 1:31.013. 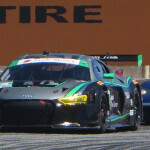 Sean McAlister/No.00 GT3 Cup was the fastest Platinum at 1:31.405; Jonah Yokubatis/No.43 GT3 Cup in Diamond at 1:31.538; Will Lin/No.5 GT3 Cup-Gold at 1:34.347; Steve Goldman/No.9 Cayman-Bronze at 1:35.564; and Chris Bellomo/No.67 Cayman at 1:36.897. In the second practice, a somewhat different cast topped their respective classes, as the times got faster. Loren Beggs/No.08 GT3 Cup was the quickest Porsche and in Diamond at 1:19.934. Preston Calvert/No.7 GT 3 Cup-Diamond Master at 1:19.152; Mcalister in Platinum at 1:29.841; Lin in Gold at 1:32.845; Laura Ely/No.09 Cayman-Bronze at 1:34.887; and Bellomo in Silver at 1:35.853. In the Super Trofeo series morning practice, Trent Hindeman and Jonathan Cecotto/No.1 Wayne Taylor Racing were the fastest in the Pro Class at 1:24.211/95.673 mph. JC Perez and Loris Spinelli/No.71 P1 Motorsports were the fastest ProAm Team at 1:24.380/95.482 mph. 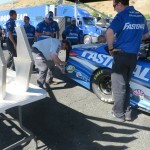 Brian Thienes/No.17 US Race Tronics was the fastest Am driver at 1:26.240/93.422 mph. Brett Meredith/No.66 P1 Motorsports was the fastest in the LB Cup Class at 1:28.990/90.535mph. In the afternoon, the speeds were a tad slower. P1 Motorsports drivers Perez and Spinelli were fastest overall and in ProAm at 1:25.264/94.494 mph. The fastest Pro drivers were Brandon Gdovic and Shinya Sean Michimi/No.46 PPM at 1:25.845/93.852 mph. Damon Ockey/No.09 US Race Tronics led the Am class at 1:26.429/03.218 mph. Sheena Monk/No.7 Wayne Taylor Racing was the fastest in LB Cup at 1:29.195/90.327 mph. 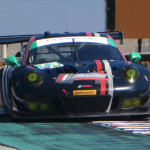 Thursday was the Promotors Test Day, which included the Porsches, Lamborghini’s and Continentals. 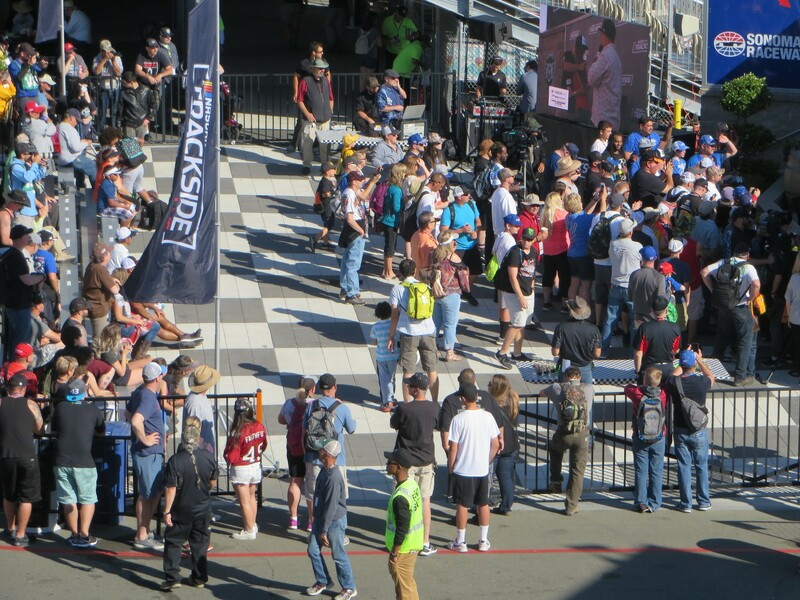 At day’s end, the IMSA sports cars fueled in pit lane, with the Emergency Crew and Pit Marshals from San Francisco Region Sports Car Club of America standing by. While this was ongoing, those team members not involved with fueling went for their Track Orientation Walk. Saturday’s schedule calls for Practice and qualifying for IMSA and Continental Series, as well as three races – Lamborghinis, Continentals and Porsches. The day starts at 8am and goes to 6:30pm, with a 50-minute lunch. The excitement never ends! 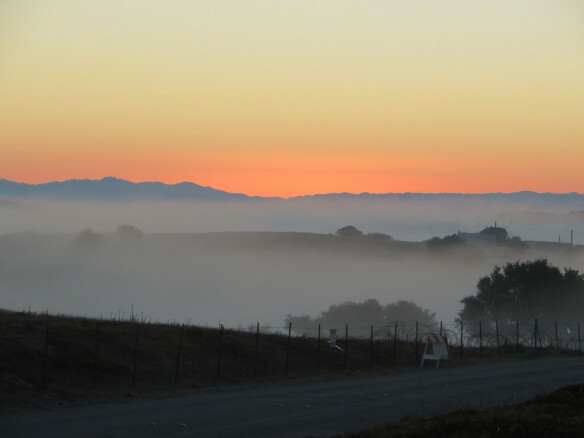 While the fog blanketed Highway #68 leading to WeatherTech Raceway at Laguna Seca, inside the track it was all sunny and bright. 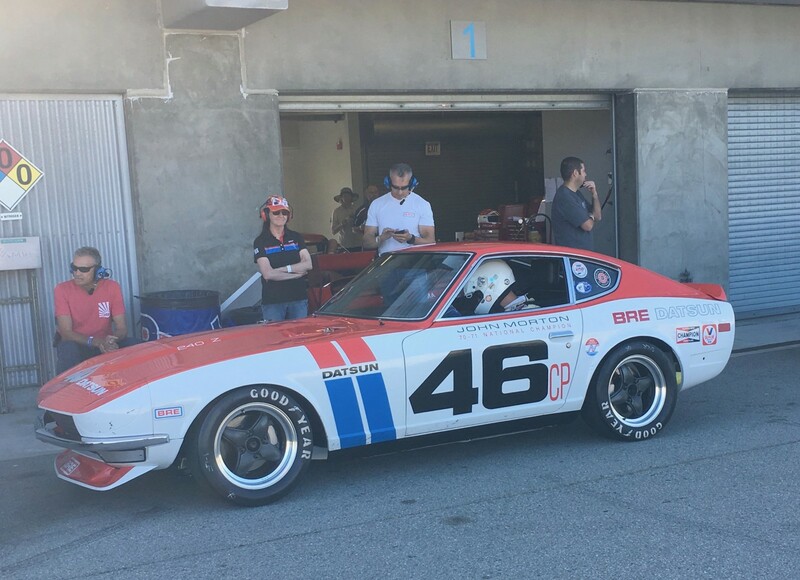 Except for a brief fog delay in the second session when a wayward belt of fog hit the Corkscrew, it was all systems go for the first of the two-day Pre-Reunion, gathering of vintage and historic race cars. 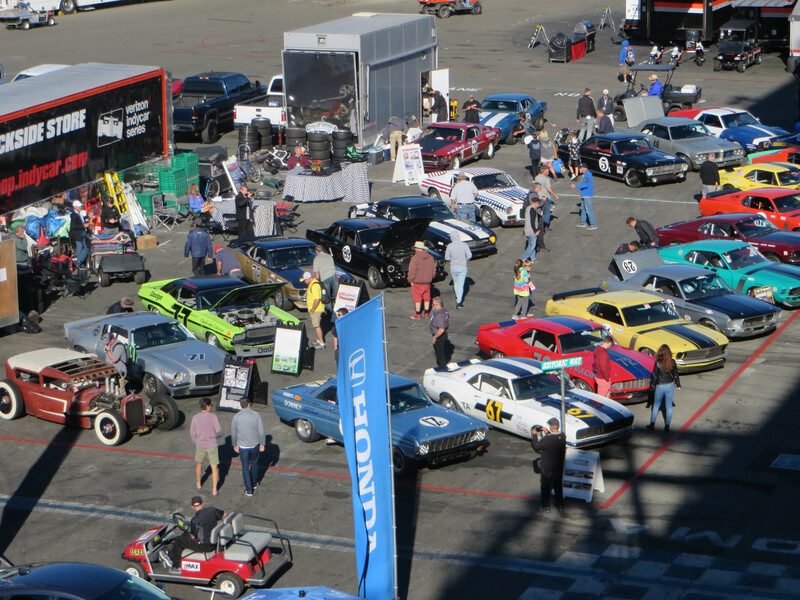 More than 300 cars are gathered here for the run-up to next weekend’s four-day Rolex Monterey Motorsports Reunion. 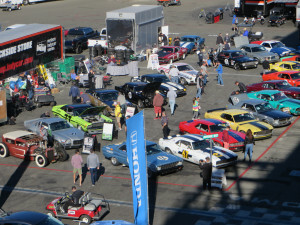 The race groups run the gamut, from cars dating back to 1947 through cars racing in 1984. This year the featured marque for the Rolex Reunion is Nissan and its illustrious racing history that dates back to its Datsun heritage. No one personifies this more than the venerable John Morton. He is racing No. 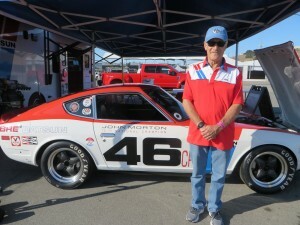 46CP 1970 Datsun 240Z in Group 5 for 1973-1981 FIA, IMSA GT, GTX, and GTU cars, alongside 38 other cars. His car has a place of honor in the paddock, all by itself near the gas pumps. 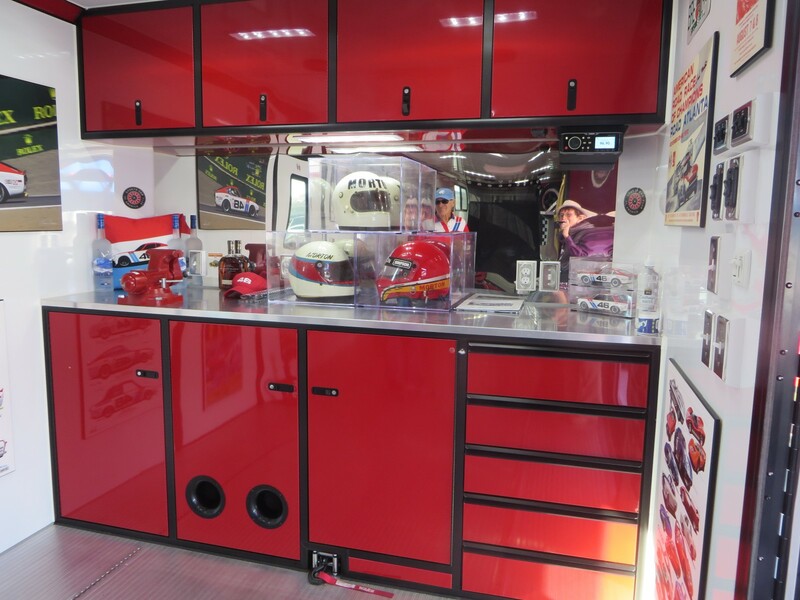 It displays the race car, with the trailer insides set up as a mini-museum containing Morton Memorabilia – posters, helmets, driver suit, and more posters. The Stainless Steel Carrot written by Sylvia Wilkinson years ago, recently updated and reprinted, chronicles Morton’s racing odyssey. 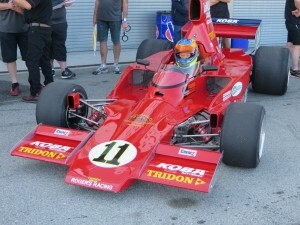 Morton is also listed as the driver in No.51A 1973 March F5000 in Group 4. But, as those two races are back to back, he had to decline the F5000 ride. To his dismay. 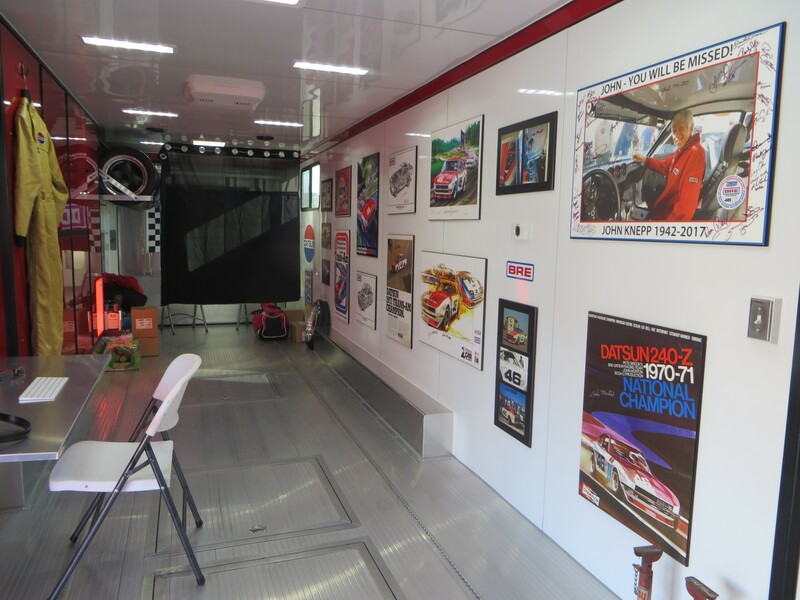 Although he is often thought of a sedan driver, Morton raced a F5000/Can Am car in the mid 1970’s. In the middle paddock there is a large gathering of F5000 cars, from all over the US as well as a large contingent flown and shipped from Down Under – New Zealand and Australia. There are 41 cars entered to celebrate their fiftieth anniversary. Here to help them celebrate is Ken Smith from New Zealand, long-time F5000 driver. 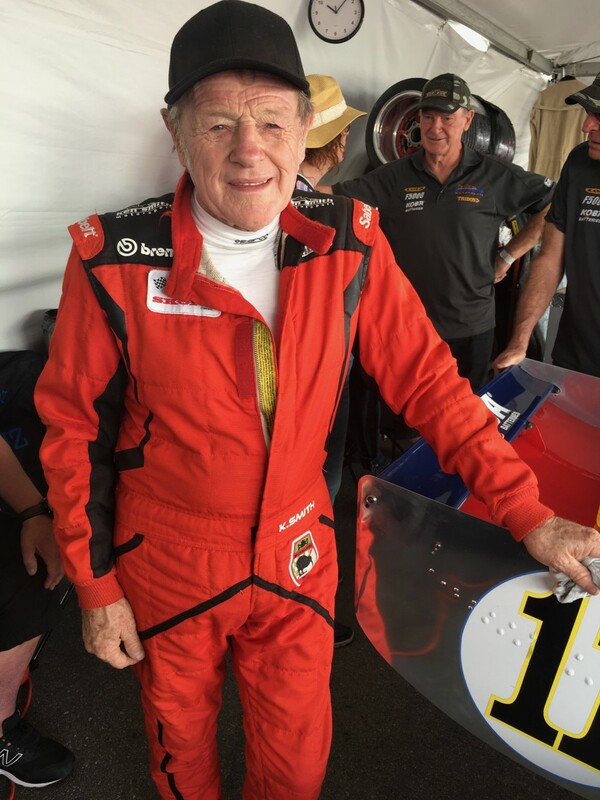 Though his race career spans 60 years and he’s been to the track before, Smith has never raced it. He has an unbroken record of competing at a national level since the 1960’s. The only other driver with that distinction is West Coast driver, Eric Haga/No.8 1970 Lol R140. 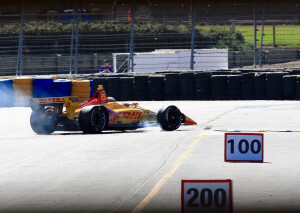 Smith’s last visit was in 2004 with then Indy Lights driver and fellow Kiwi, Scott Dixon. Smith is racing No. 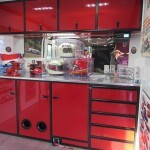 11 1975 Lola T332. After the Saturday morning session, Smith said he found the course interesting, and it will take him a bit of time to learn it. Some drivers have been here before and one of them pinged the radar gun in Turn 1 at 145 mph. Smith laughed that it wasn’t him. Michael Collins from New Zealand piloted his No.94 1972 GM McRae to victory, taking the lead on the penultimate lap of the 8-lap race. He bested fellow Kiwi, Steve Ross/No.5B in No.1972 Macrae GM1, who led the first six laps. A field of 35 took the green flag, and 29 finished the race. 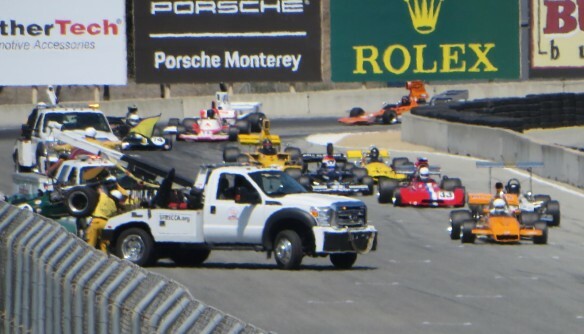 During the Saturday afternoon F5000 race, Seb Coppola/No.12 1970 Lola T192 had an unfortunate meeting with Martin M. Fogel Jr/No.11T 1969 MCLaren M10A, and hit the Turn 11 exit wall, necessitating assistance from the SFR Emergency Crew. The drivers are alright, but Coppola’s Lola will need some TLC. The Safety Car won more than one race Saturday afternoon. In Group 7 for FIA Manufacturers Championship Cars, Neil Alexander/No.1964 Porsche Platypus spun out in Turn 1 hitting the tire wall hard, dislodging the tires and rubber banding. Roger Cassin/No.256 1964 Elva Mk7S spun out evasive. That effectively ended that race. The drivers are alright. Heavy duty track equipment helped the SFR Course Marshals repair the damage. The drivers were definitely eager to show their stuff this weekend. More than one group started racing before the green flag, sometimes three wide. 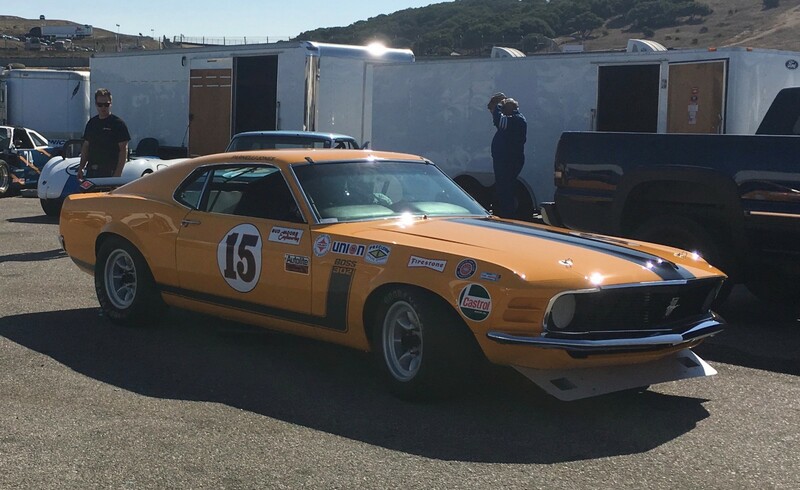 Group 6 for 1966-1972 Historic Trans-Am cars was lively, with three different leaders, with Chris Liebenberg/No.16 (116) 1970 Ford Mustang Boss 302 the winner of the nine-lap race. Other leaders were Jim Hague/No.16T (16) 1970 Ford Mustang Boss 302 John Hildebrand/No.49 1964 Pontiac Tempest/GTO and No.16T. This was a small field – only 14 of the 20 entries competed. It was a bit confusing as the two butterscotch-colored Mustangs had identical numbers. The only difference was the color of their wheels. A third butterscotch 1970 Mustang was No.15 raced by William Connor, who finished third in the race. Sunday’s schedule calls for morning practice and afternoon races for al ten race groups. 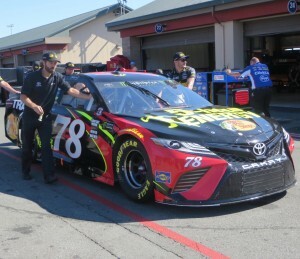 Martin Truex, Jr/No.78 5-hour ENERGY/Bass Pro Shops Toyota won the 30th Annual Toyota/Save Mart 350 Monster Energy NASCAR Cup Series Race at Sonoma Raceway, with a 10.513 second Margin of Victory ahead of Kevin Harvick/No.4 Mobil 1 Ford. Truex led four times for 62 laps, the most of any driver. 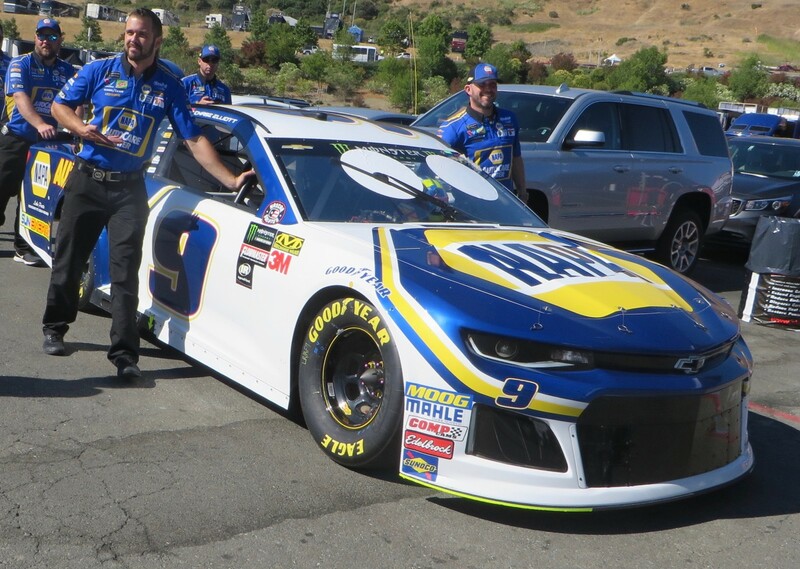 Truex is a repeat winner at Sonoma, breaking the streak of nine different winners in nine races. 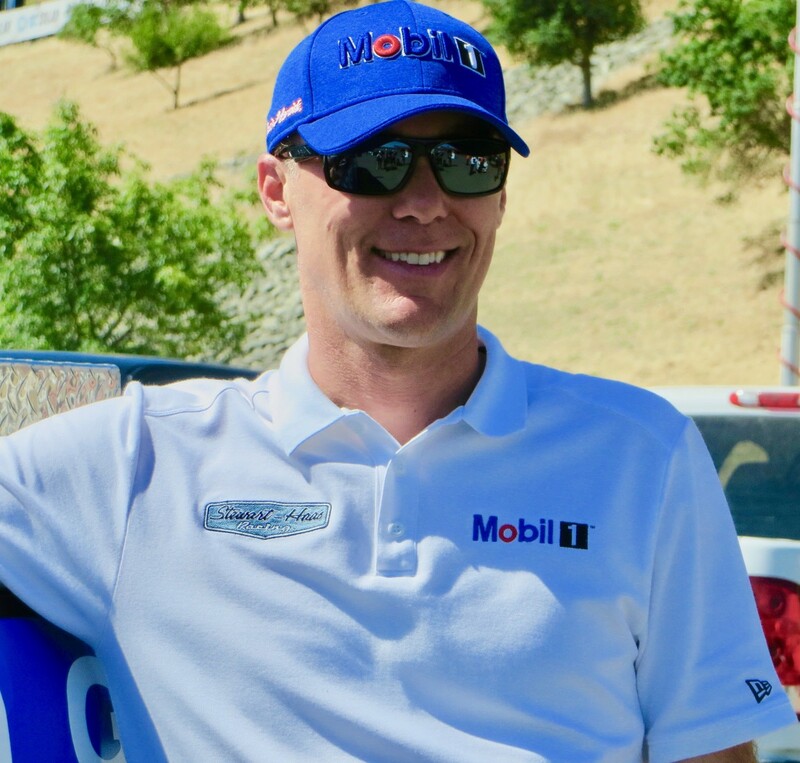 This is his third victory this season, his third on a road course as he won Sonoma in 2013, 18th in Cup, and his second road course win in a year as he won Watkins Glen last year. The weather was a mild 80 degrees F, with 12 mph breezes and 46 percent humidity. Truex was running second behind Harvick, when Harvick pitted. Truex stayed out, although his Crew Chief, Cole Pearn, called an audible and then rescinded. 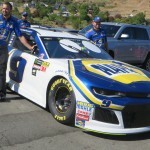 Fourth and fifth were Chase Elliott/No.9 NAPA Auto Parts Chevrolet, and Kyle Busch/No.18 M&M Caramels Toyota. Busch still leads the overall Driver standings, 72 points ahead of Harvick, but Harvick has one more Playoff point than Busch. Truex is now fifth overall, and third in Playoffs. The top Rookie was William Byron/No.24 Liberty University Chevrolet, who finished twenty-fifth. He leads the Rookie standings. 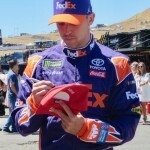 Denny Hamlin/No.11 FedEx Express Toyota won Stage Two. Truex won Stage Three and the race. 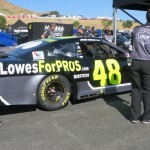 There was only one two-lap caution for cause – a new record for Sonoma; and two cautions to end stages – three laps each. 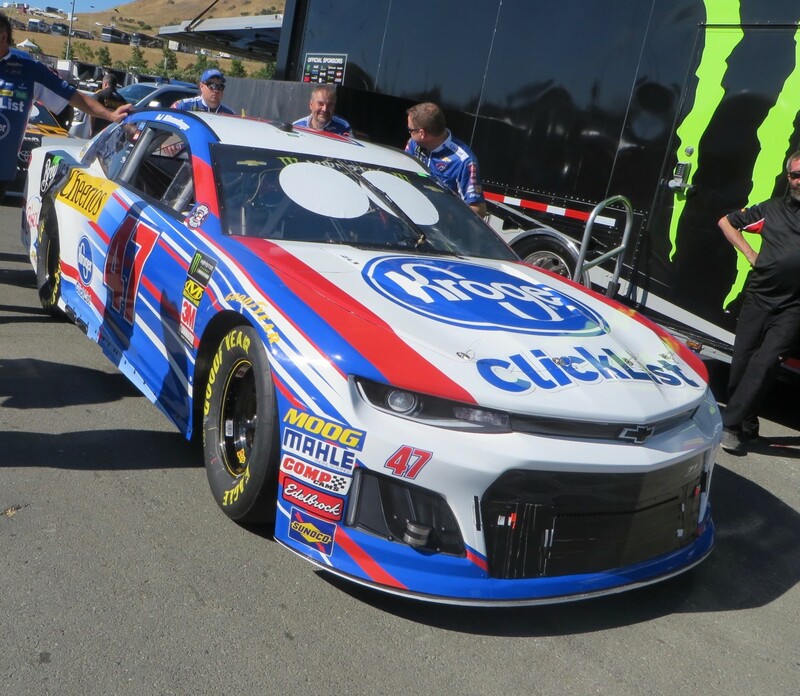 AJ Allmendinger/No.47 Kroger ClickList Chevrolet brought out the second caution of the race after he missed a shift/blew up early on in Stage Two and stalled on course going uphill to Turn One. He said it was the first shift he’s missed on a road course in ten years. It was especially sad for him as Allmendinger had just won Stage One. He had gridded fifth and worked his way up to take the lead on Lap 23 of the 25-lap stage. With so few cautions, the race speeds just kept increasing, and by the last 15 laps of the race, almost every lap was faster. The average race speed was 82.862 mph, compared to last year’s average of 78.71 mph. The average race speed in Stage One was 89.692. Twenty-one cars of the finishers were on the lead lap. Only one driver retired due to an accident – Cole Whitt/No.72 Chevrolet, who hit the wall. It didn’t even bring out a caution and he was alright. 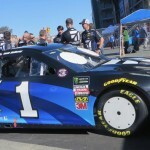 Jamie McMurray/No.1 Cessna Chevrolet had oil pump problems, lost pressure and the engine shut off. Cody Ware/No.52 SBC Contractors/Bubba Burger Chevrolet had fuel pump problems. 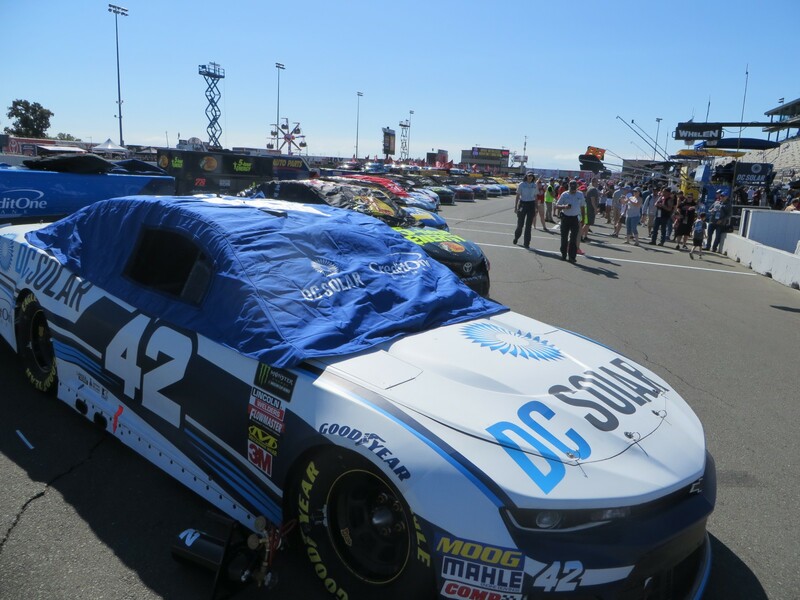 Pole sitter Kyle Larson/No.42 DC Solar Chevrolet led two laps and finished fourteenth. 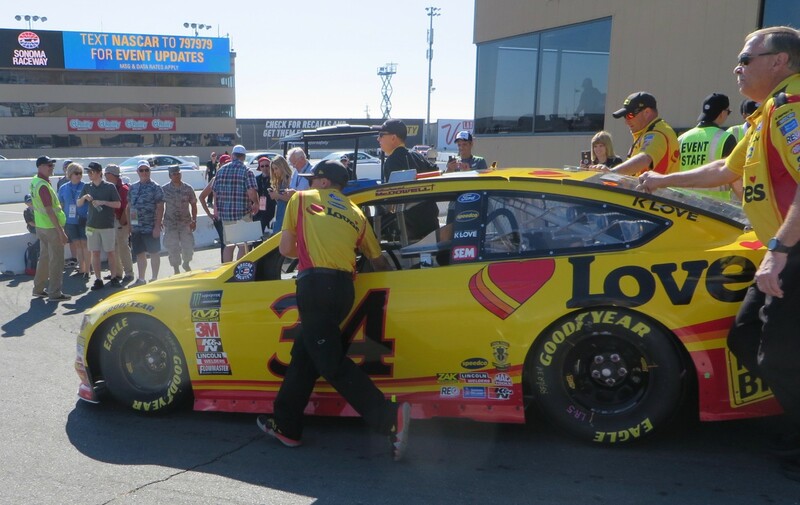 There were seven leaders with 11 lead changes: Pole sitter Larson; Truex; Harvick, Allmendinger; Denny Hamlin/No.11 FedEx Express Toyota-four laps; and Erik Jones/No.20 DeWalt Toyota and Kurt Busch/No.41 Haas Automation Ford who each led a lap. All cars cleared tech and no cars were taken back to the NASCAR R&D Center. 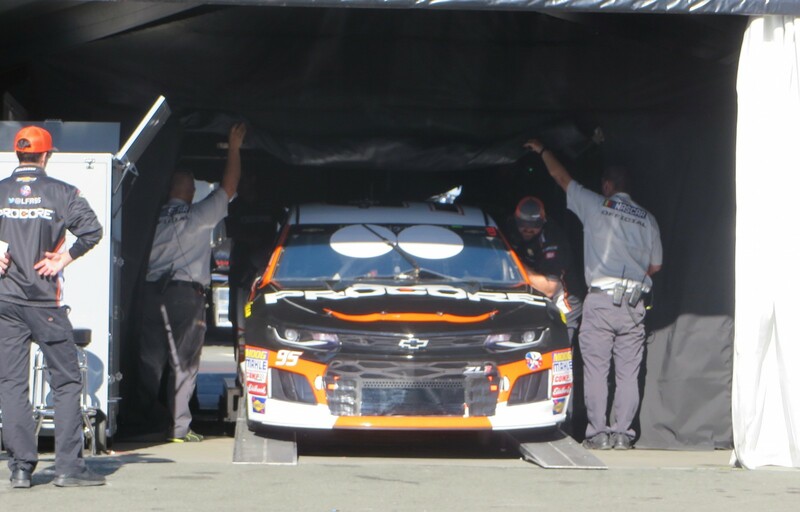 The engine from Truex’s car did go back for inspection. 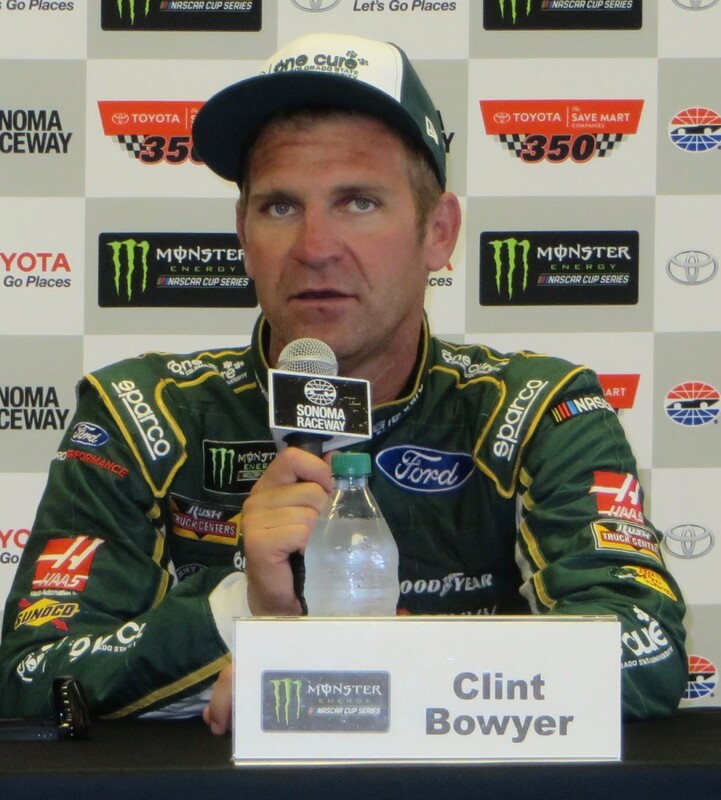 The next MENCS race is the Overton’s 400 1 July 2018 at Chicagoland Speedway, airing live on NBCSN at 2:30pm ET. 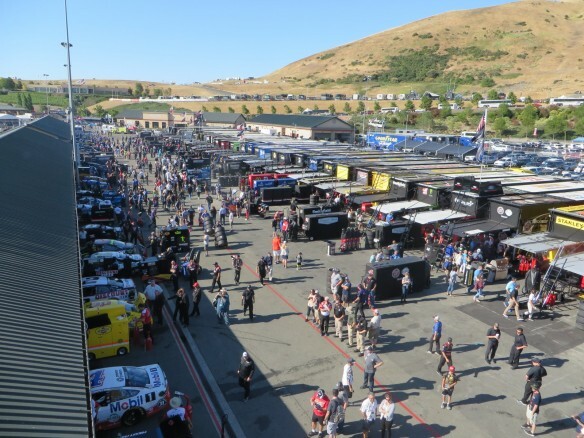 It’s a beautiful day in the neighborhood – if that happens to be Sonoma Raceway for the Toyota/Save Mart 350 Monster Energy NASCAR Cup Series Race – and try saying that five times fast. It’s 71 degrees F and only predicted to have a high of 77 – quite a welcome drop from Saturday’s 101 F. The humidity is 58 percent and the wind is desultory in places, and frisky in others. 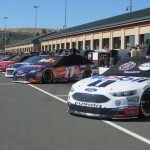 Sonoma Raceway, an elevated road course, is utilizing the 1.99-mile, ten turn NASCAR configuration. It has 160 feet (49 m) of total elevation change. The track was opened fifty years ago. There are mobs of people everywhere. Tours are being led, gaggles and groups are clogging the byways and and there’s a lot to see. The view from the Spotters’ Stand on top of the John Cardinale Media Center is amazing, and appreciated all the more for the very steep and tall ladder one must traverse. Spotters used to go on top of the Drag Tower, but when the new, big ISM Vision TV screen was installed outside the top floor and roof, no one could see over it. 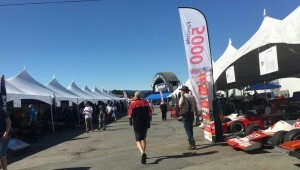 There’s a busy Pre-Race Schedule with two separate air shows – Wild Thing Airshows with ex-Romanian Military IAR-823 aircraft & Patriots Jet Team Air Show for 25 minutes with six-L-39 albatross jets; lots of pomp and circumstance with bands and grid girls, introductions, presentations, traditions, Driver Introductions and Driver’s Parade. 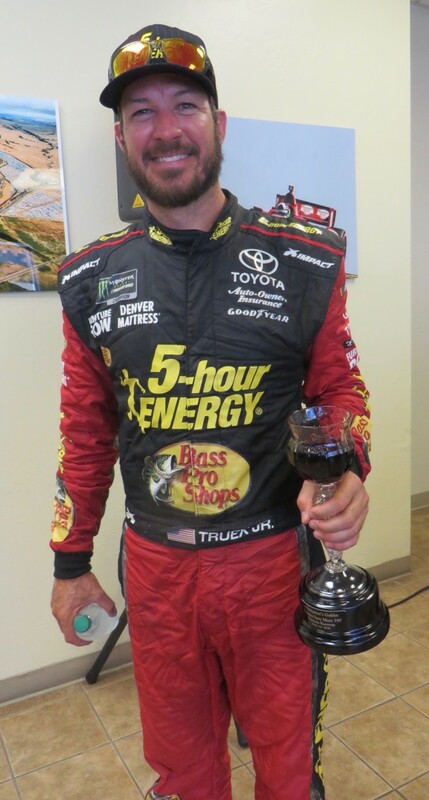 Throw in live pre race telecast in Victory Lane and Talk With The Champ – Martin Truex, and you have a plethora of choices. In the garages, the teams pushed their cars down to the pit lane – a veritable parade, with a variety of techniques for negotiating the pit ramp. In Pit Lane it’s sensory overload with all the colors. 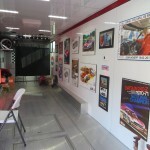 liveries, signs, logos, and tchotchkes on the car hoods. 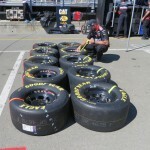 Pit Tours, Pre-Race TV broadcasting, and crews tire marking for quick installation. So much going on. Drivers made their way to the stage for their introductions, wending their way in some instances past the fans. 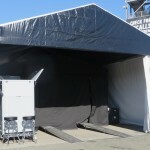 The field of 38 cars is lined up in Pit Lane and covered up from the heat. The race stages will be 25 laps, 50 laps and 110 laps. The race distance is 218.9-miles/110 laps. 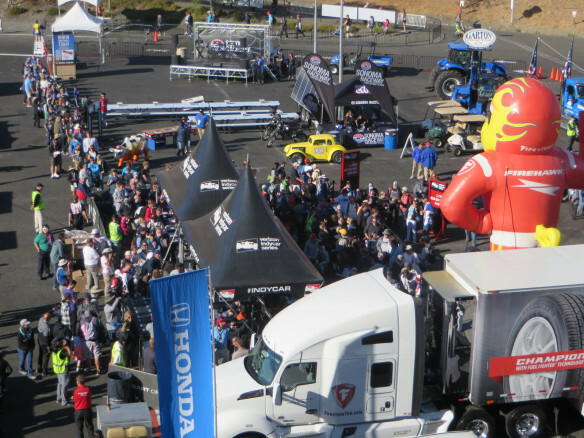 Each driver will execute 1,210 turns during the race, so said the talking heads on the FSI Pre Race Show. The race will be telecast live on Fox Sports 1. 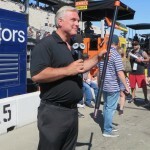 Pole sitter Will Rodgers/No.7 KELLY Benefit Strategies Ford learned well from his teammate last year – Kevin Harvick – how to get through Turn 11 and how to handle restarts. Rodgers finished a close second last year to Harvick in the K&N Pro Series West Carneros 200 Race, and this year he won a hard fought victory, and he turned the fastest race lap of 89.424 mph. He led 35 of the 64-laps. This was is second road course victory in as many races – and back to back – East Coast and West Coast Series. And it’s a good thing he subscribes to the ‘rubbin’ is racin’ philosophy as there was some of that. Rodgers led laps and got racy with those surrounding him, falling back at one point to seventh place. But he clawed his way back and with some gutsy driving with Cup drivers Daniel Suarez/No.No.54 ARRIS Toyota and Aric Almirola/No.41 DenBeste Water Solutions Ford, he prevailed after a daring pass of Almirola in Turn 11. Finishing second, 4.420 seconds behind was Almirola. 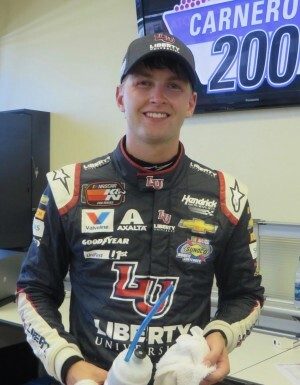 Third was another Cup driver, William Byron/No.27 Liberty Chevrolet. 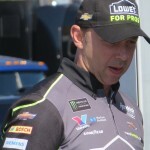 Byron has Max Papis as his full-time driver coach. Suarez finished fourth, and Ryan Partridge/No.9 Sunrise Ford/Eibach/Lucas Oil/Braille Ford came in fifth – taking the points lead by one point. The race is always exciting and a crowd pleaser. This time was no exception. 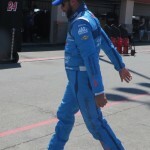 There were lead changes – Rodgers – Almirola – Suarez. It would be interesting to see a lap chart. There were some crashes and hurt cars, but the drivers were all OK. It was a race of attrition as several cars gave up the ghost and retired. Most made it the Pit Lane on their own, some with help. 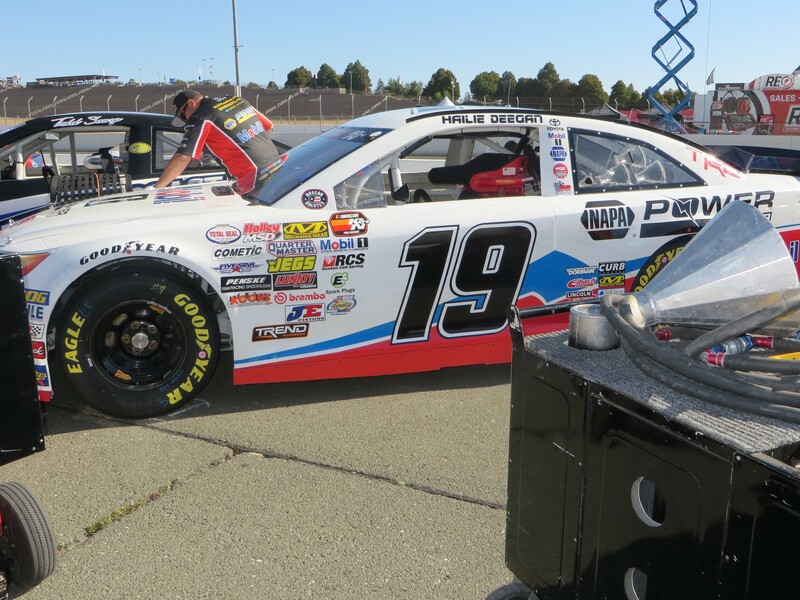 Hailie Deegan/No.19 Mobil 1/NAPA Power Premium Plus Toyota was the top finishing Rookie, coming in seventh behind Cup driver Erik Jones/No.9 Dewalt Toyota. 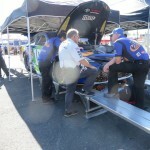 Deegan, who races with Bill McAnally Racing, had gridded third and stayed in the front pack despite the aggressive drivers of others in that group, which included most if not all the five Cup drivers at any given time. She held her own and made a killer outside pass late in the race in turn 9 – and made it stick. That was a particularly frantic lap already and Deegan at that point had already been smoking for a couple of laps. She kept on driving and pushing, gaining positions after the smoke first appeared. Deegan now leads the Rookie standings and has moved up to fifth in the overall points. Deegan has been racing since she was eight. Her father, Bert Deegan, is a noted dirt, motorcycle and off-road racer. They come from Temecula CA, but are building a house in Mooresville NC. She was home schooled and just graduated. During Driver Introductions, she had a ‘mini-graduation, complete with cap, gown and diploma. Deegan said she wants to race on the East Coast, and is looking at the K&N Series and the Late Model Series. She definitely wants to stay in stock cars, 100 percent. “I want to race on Sunday. 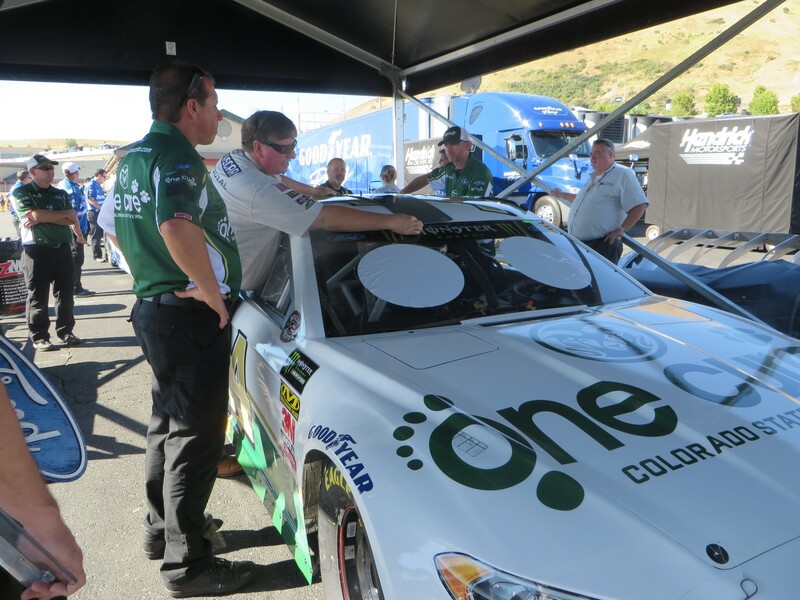 That’s the goal.” Deegan was coached by Chris Cook as she’d never been on the Sonoma race track before. She drove a Trans-Am car, which was a little different and it was about a thousand pounds lighter, but it was still helpful. She also ran the NASA race in a Mazda Miata – “not the highlight of my career.” Deegan was clear that she doesn’t want to be like Danica (Patrick), whom she thinks moved up too fast. Deegan wants to take it slower and in steps. 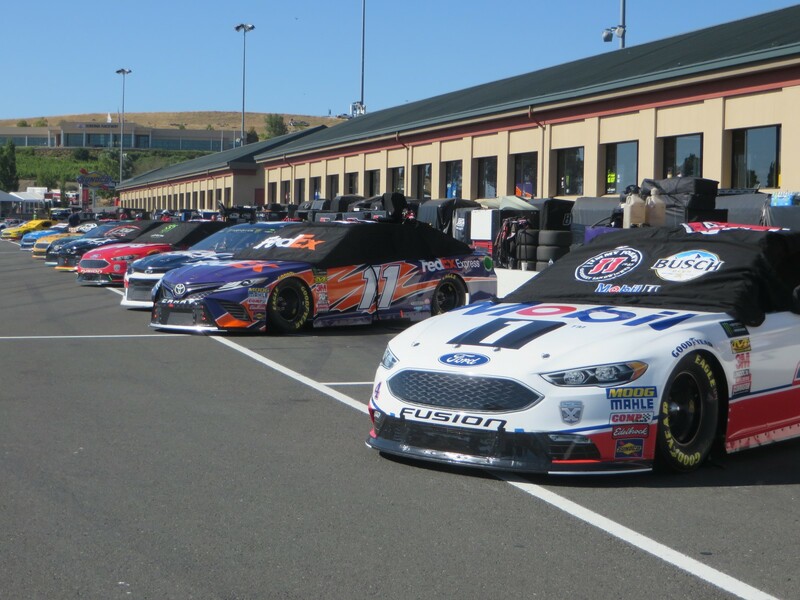 Deegan raced a K&N race in Bakersfield against Kevin Harvick and said she learned a lot. And the two have kept in contact. To prepare for this first-ever road race, she had some coaching from Chris Cook, a Bondurant instructor and part-time NASCAR driver. 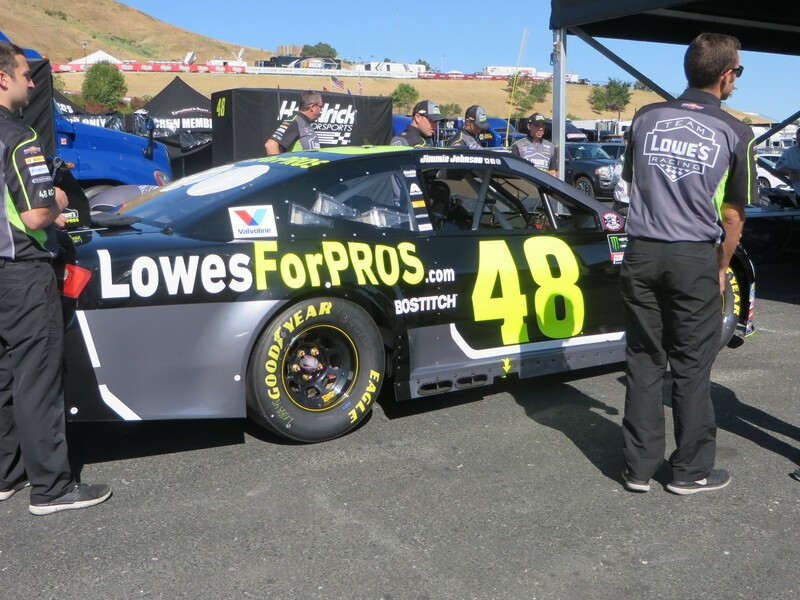 He’s racing No.51 Shockwave Chevrolt in Sunday’s Cup race, and she will definitely will be around for that, perhaps on the Pit Box. 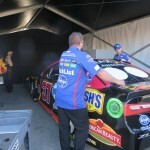 Team Owner Bill McAnally said what impressed him about Hailie at her first test was her feedback. She immediately was able to say what she wanted in the car to go faster, and when she got it, she went faster. Deegan came to his attention via Toyota Racing Development’s Driver Development program for young, upcoming drivers. 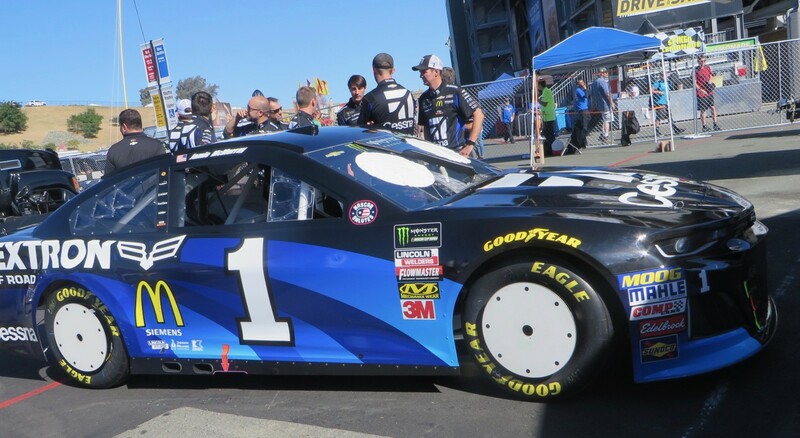 They in turn introduced her to McAnally, along with several other young drivers, and she’s been a part of the NASCAR NEXT Development program for the past two years – the only female this season. She has her roots in off-road racing. For those who missed the race, or want to relive all the excitement, it will be aired on NBCSN Thursday 28 June 2018 at 6 pm ET. 1. 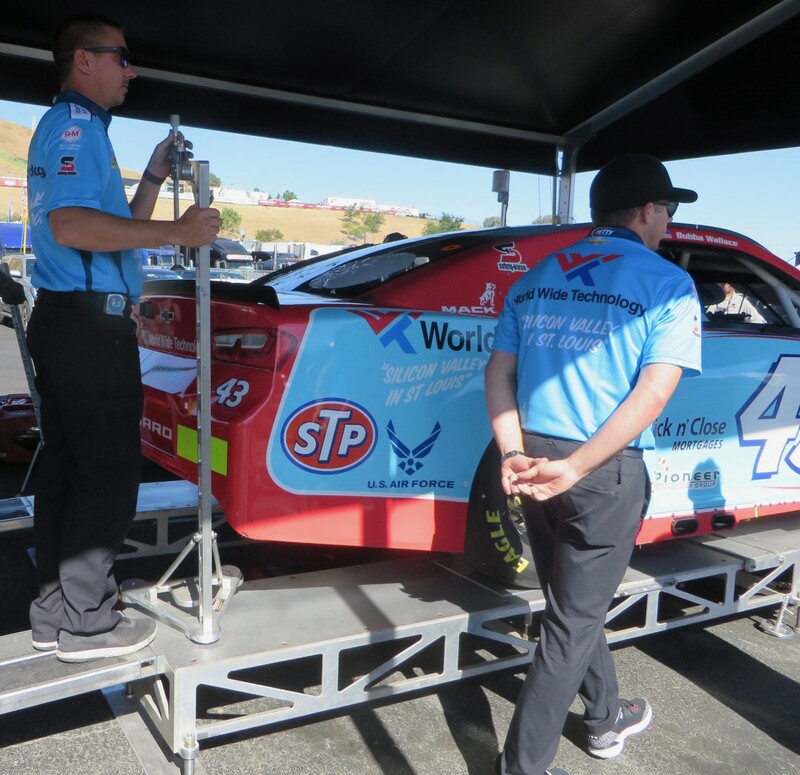 (1) Will Rodgers, Solvang, Calif., Ford, 64 laps, 58.482 mph. 2. (5) Aric Almirola, Tampa, Fla., Ford, 64. 3. (2) William Byron, Charlotte, N.C., Chevrolet, 64. 4. 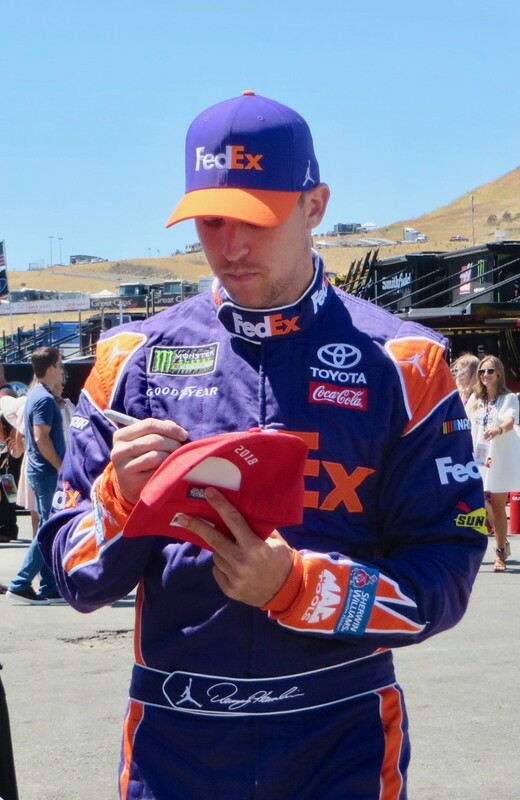 (6) Daniel Suarez, Monterrey, Mexico, Toyota, 64. 5. (4) Ryan Partridge, Rancho Cucamonga, Calif., Ford, 64. 6. 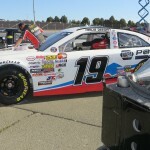 (13) Erik Jones, Byron, MI, Toyota, 64. 7. (3) Hailie Deegan, Temecula, Calif., Toyota, 64. 8. (9) Derek Thorn, Lakeport, Calif., Ford, 64. 9. (16) Cole Keatts, Lewiston, Idaho, Ford, 64. 10. (8) Derek Kraus, Stratford, Wisc., Toyota, 64. 11. (11) David Mayhew, Atascadero, Calif, Chevrolet, 64. 12. (14) Cole Rouse, Fort Smith, Ark., Toyota, 64. 13. (18) Tom Klauer, Reno, Nev., Chevrolet, 64. 14. (26) Rodd Kneeland, Sonoma, Calif., Chevrolet, 63. 15. (20) Jesse Iwuji, Carrolton, Texas, Chevrolet, 63. 16. 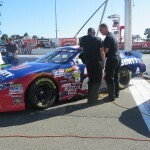 (24) Rich DeLong III, Santa Clarita, Calif., Chevrolet, 63. 17. 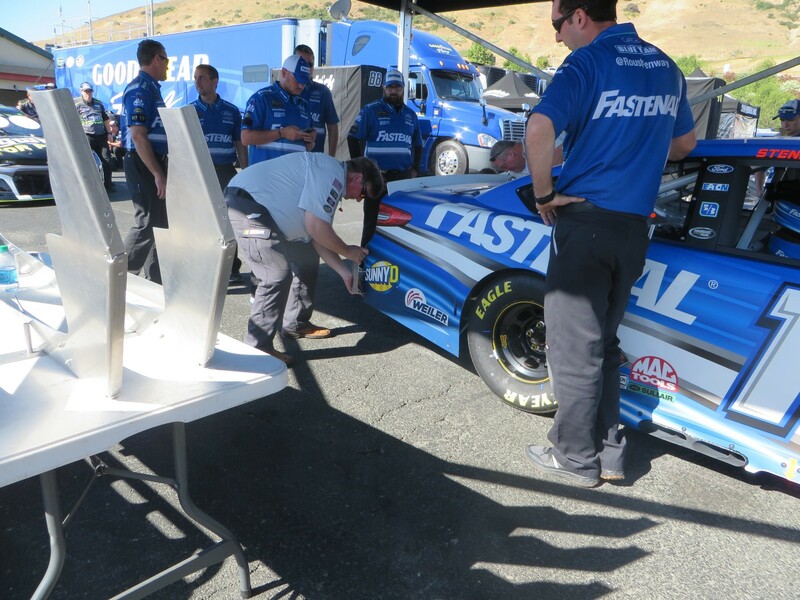 (10) Kody Vanderwal, LaSalle, Colo, Ford, 56, engine. 18. (12) Jim Inglebright, Fairfield, Calif., Chevrolet, 46, clutch. 19. 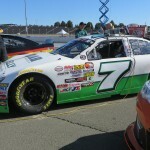 (15) Todd Souza, Aromas, Calif., Toyota, 45, engine. 20. (25) Trevor Huddleston, Agoura Hills, Calif., Ford, 44, electrical. 21. (17) Travis Milburn, Eagle, Idaho, Chevrolet, 39, electrical. 22. (19) Carlos Vieira, Atwater, Calif., Ford, 31, accident. 23. (23) Hollis Thackeray, Gridley, Calif., Toyota, 17, transmission. 24. 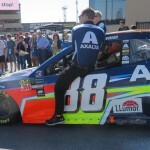 (7) Alex Bowman, Tucson, Ariz., Chevrolet, 10, engine. 25. (21) Takuma Koga, Nagoya, Japan, Chevrolet, 9, accident. 26. (22) Matt Levin, Tucson, Ariz., Chevrolet, 1, accident. 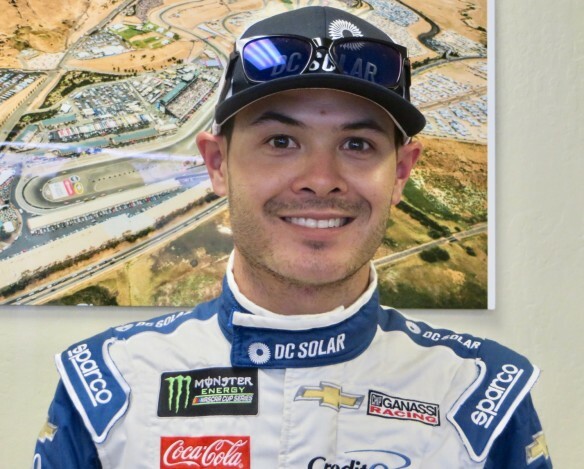 Kyle Larson/No.42 DC Solar Chevrolet has the pole for the 30th Annual Toyota/Save Mart 350 Monster Energy NASCAR Cup Series race, with a lap of 94.597 mph/1:15.732. It did not break the qualifying track record he set in 2015 of 96.568 mph/1:14.186. 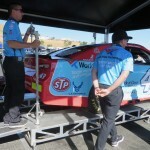 This is Larson’s sixth Cup pole position, and back to back from Sonoma last year. 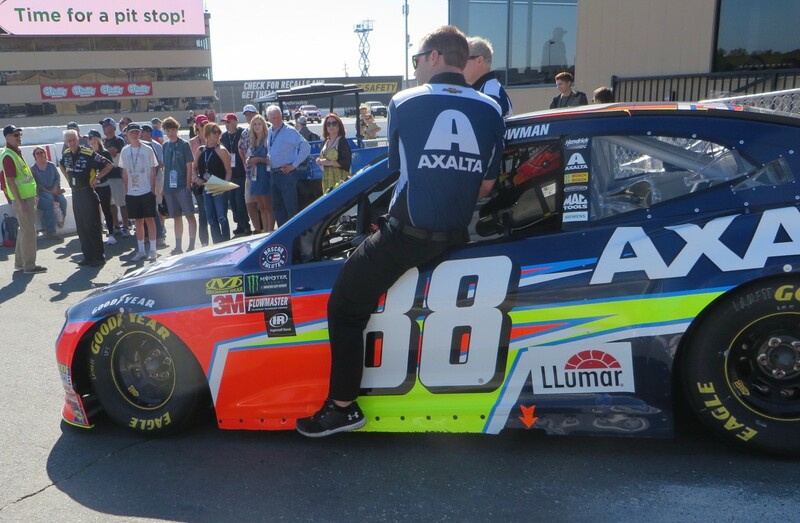 It also is the 697th overall Cup pole win for Chevrolet in the series, and 15th at Sonoma Raceway. It was 93 degrees at the start of Cup Qualifying, with 33 percent humidity and winds of five mph. It continued to heat up to 101, the wind picked up and the humidity continued to drop. 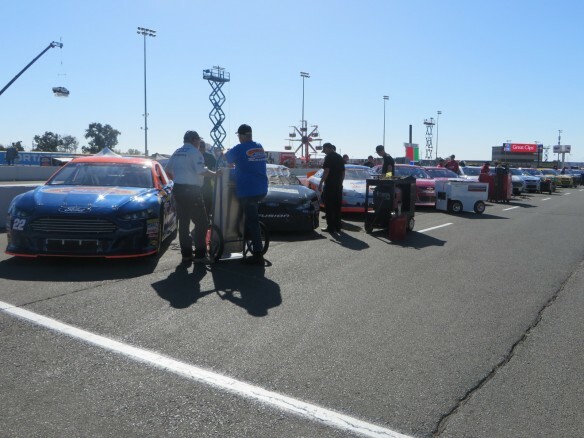 The Cup qualifying session was delayed due to extensive cleanup during qualifying for the K&N Pro Series West Carneros 200 Race, after the track was extensively oiled from the Esses to Pit Lane. The announcer said it resembled the oil slick from the Exxon Valdeez. Billy Kahn/18 Interstate Batteries Chevrolet grenaded his engine and flamed out while driving through Turn 8, leaving a swath not unlike the Exxon Valdez. With the humidity already low and lowering by the minute, no doubt Kahn felt it was wiser to continue to the pits rather than pull his flaming car off into the tinder-dry grass. 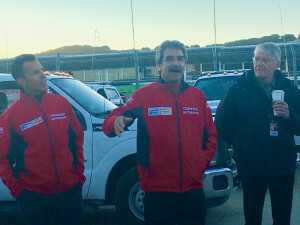 Left to Right: Chase Elliott, Jamie McMurray, and AJ Allmendinger. 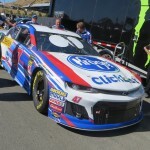 Third through fifth were Chase Elliott/No.9 NAPA Auto Parts Chevrolet; Larson’s Chip Ganassi Racing teammate, Jamie McMurray/No.1 Cessna Chevrolet; and AJ Allmendinger/No.47 Kroger ClickList Chevrolet – who also has had a pole position at Sonoma. Four of the top five were Chevrolets. Points leader Kyle Busch/No.18 M&M Caramels Toyota qualified ninth. For Cup qualifying, they had two groups. 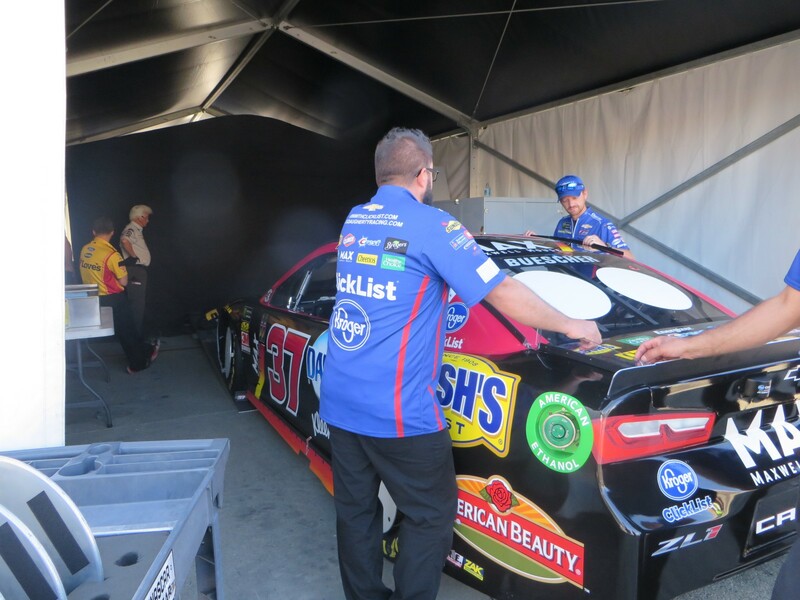 The first group was the field, and AJ Allmendinger/No.47 Kroger ClickList Chevrolet was fastest at 94.4770 mph/1:15.828. The second group was the top 12 from Group One. During Cup Group One, more than several of the drivers sat up in ‘The Bus Stop’ by Turn 9 area waiting for a clear spot to take their flying lap. They were playing chicken with the clock. Left to Right: Will Rodgers, William Byron, and Hallie Deegan. 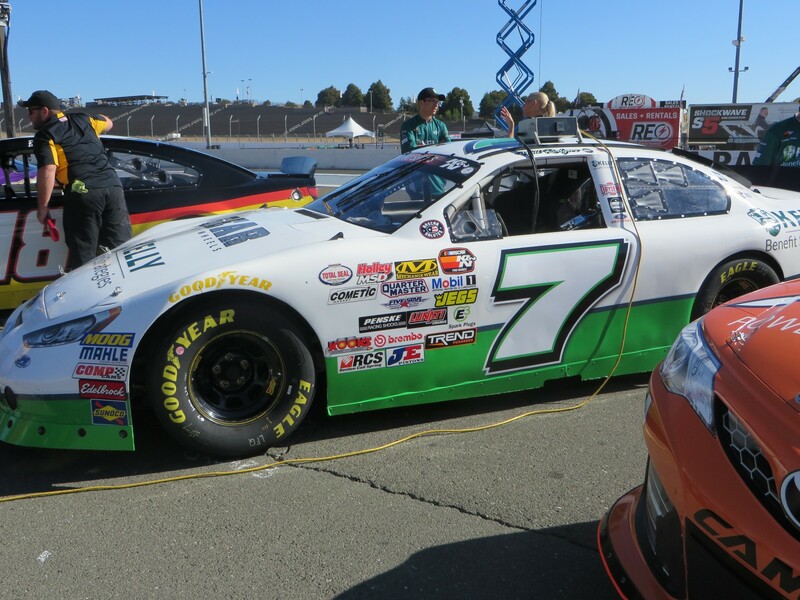 Will Rodgers/No.7 KELLY Benefits Strategies Ford took the pole position for the K&N Pro Series West Carneros 200 Race with a lap of 90.591 mph/1:19.081, faster than he ran Friday. He was in the third of the three qualifying groups with the third being the fastest, based on Friday practice speeds. 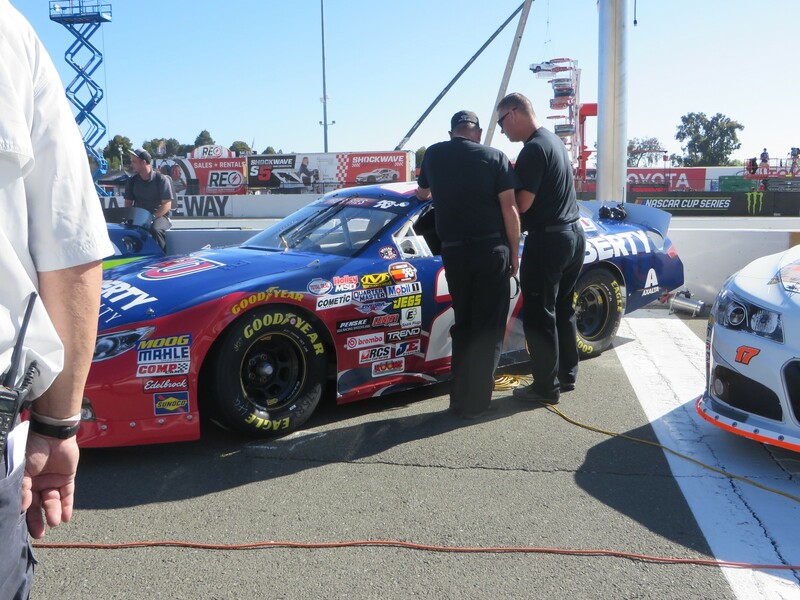 His lap and that of William Byron/No.27 Liberty Chevrolet pipped the top speed of Group Two leader, Rookie Hailie Deegan/No.19 No.19 Mobil 1/NAPA Power Premium Plus Toyota, who will grid third. The K&N West qualifying track record of 92.794 mph/1:17.203 at Sonoma was set by Cup driver, Kyle Larson on 21 June 2014. 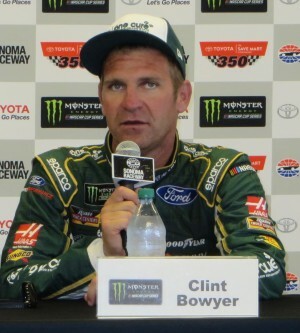 He holds the qualifying records in both NASCAR series which run at Sonoma. 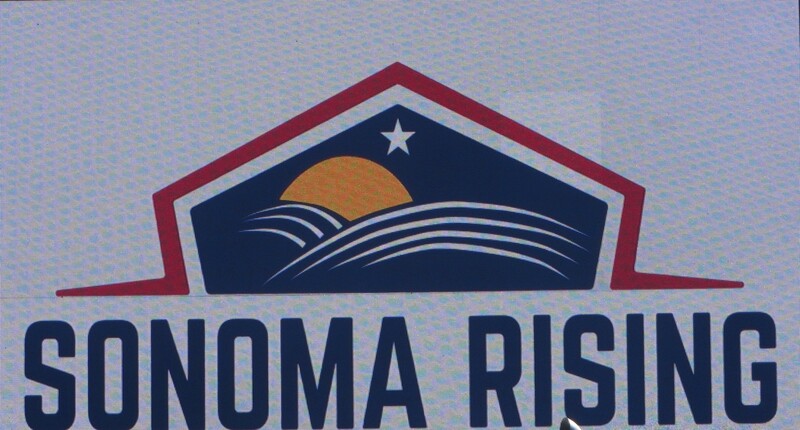 A native of nearby Elk Grove CA, Sonoma could be considered his ‘home’ track. In the first group, Cole Keats/No.55 Peters & Keats Equipment Ford was fastest at 86.659 mph/122.669. There was drama in Group Two, first with Deegan jumping from mid-pack times to fastest. 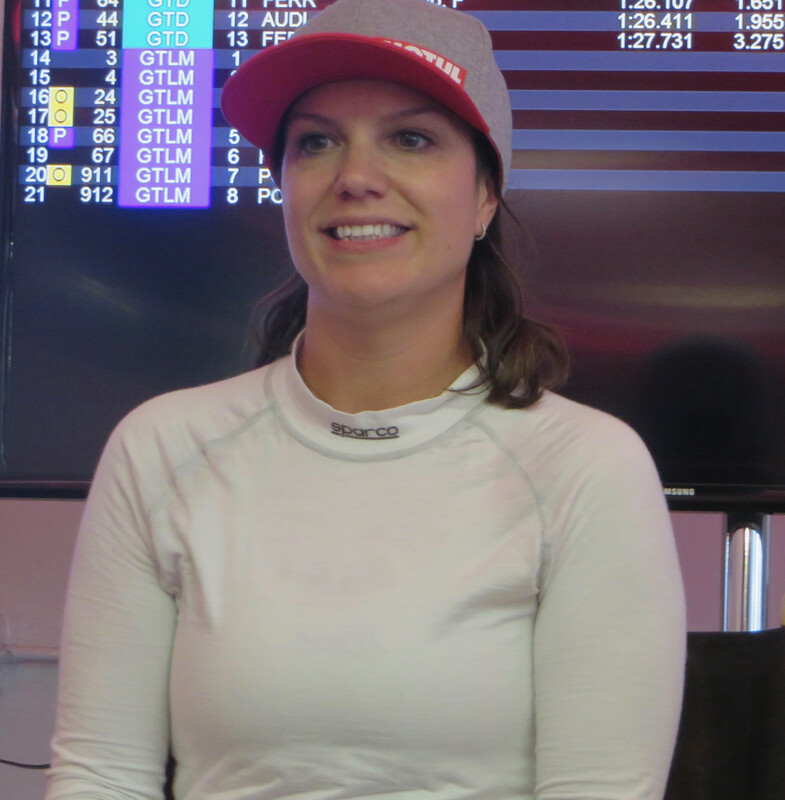 This is her first road course and her lap was 89.8270 mph/1:19.753. The other drama was Kahn’s car fire. Group Three had to drive through the oil slick. By the end of their first qualifying lap, the caution came out to check the course conditions, after drivers had radioed in. A lengthy track cleanup prolonged the afternoon. 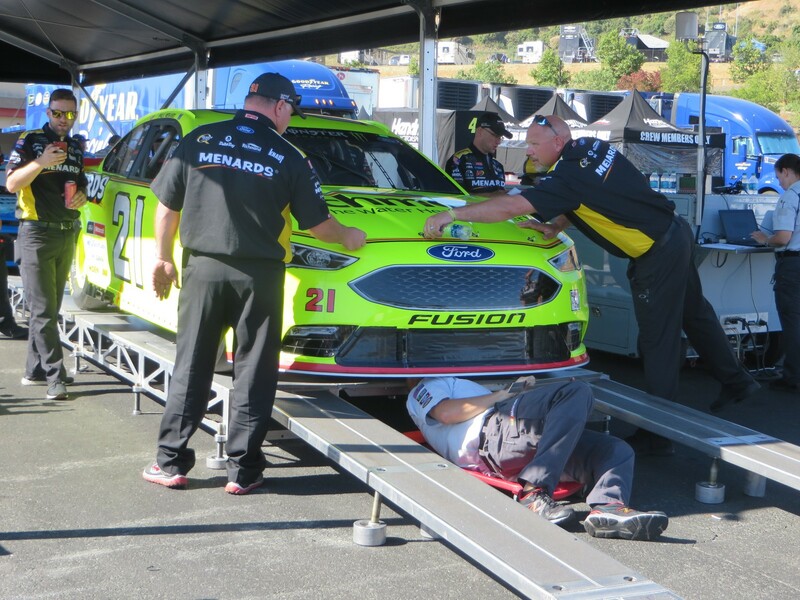 The scrutineering process for the MENCS has changed this year, with a more formalized, technilogical process. 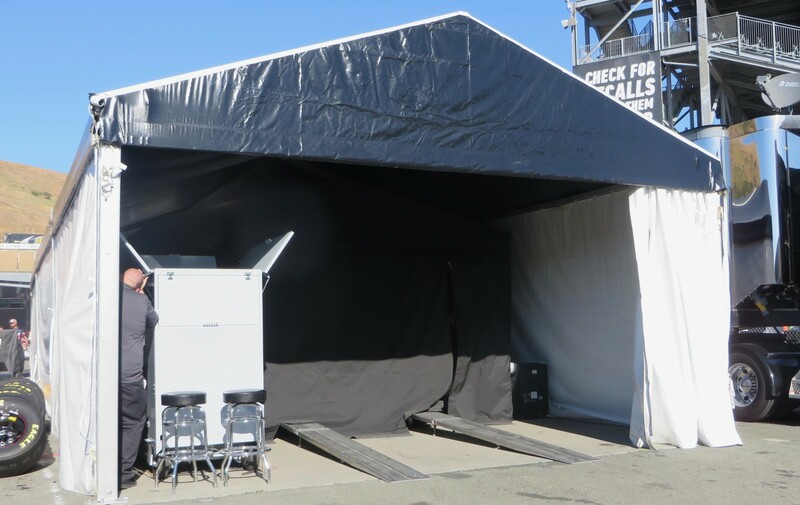 There are four stations the cars must visit, with the third now being in a closed, darkened tent with black flaps at each end, the better to protect the laser equipment measuring the various dimensions. The first three are in the paddock, and the fourth was in Pit Lane, after which time the cars lined up for Qualifying. 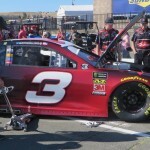 Normally the crew members push the car station to station, remaining with the car during the process and sometimes doing things directed by NASCAR officials. 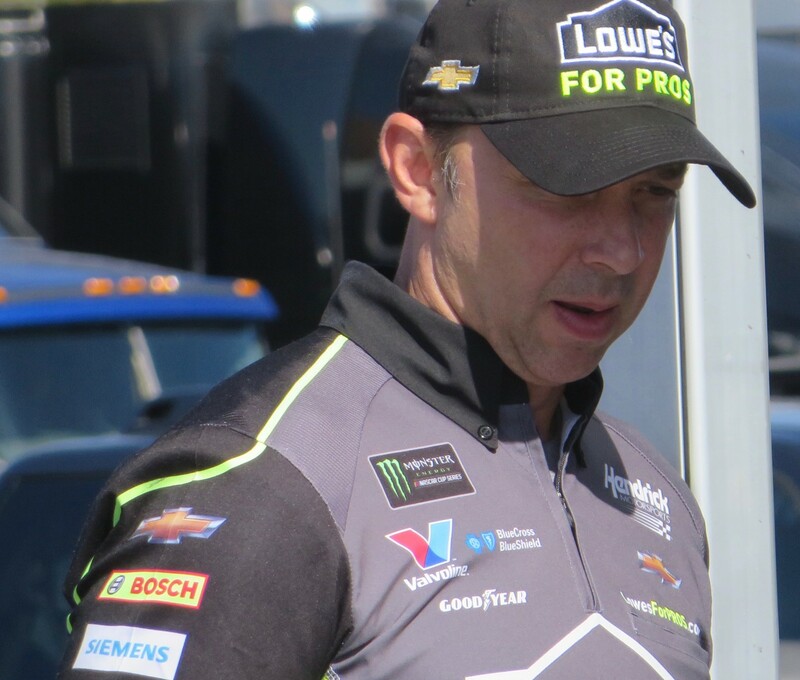 In watching Jimmie Johnson/No.48 Lowe’s for Pros Chevrolet going through a station, it was interesting to watch the ever-vigilant Crew Chief, Chad Knaus, one of the more technically creative Crew Chiefs, watching every single move and checking the car stem to stern before it rolled into the station.